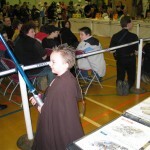 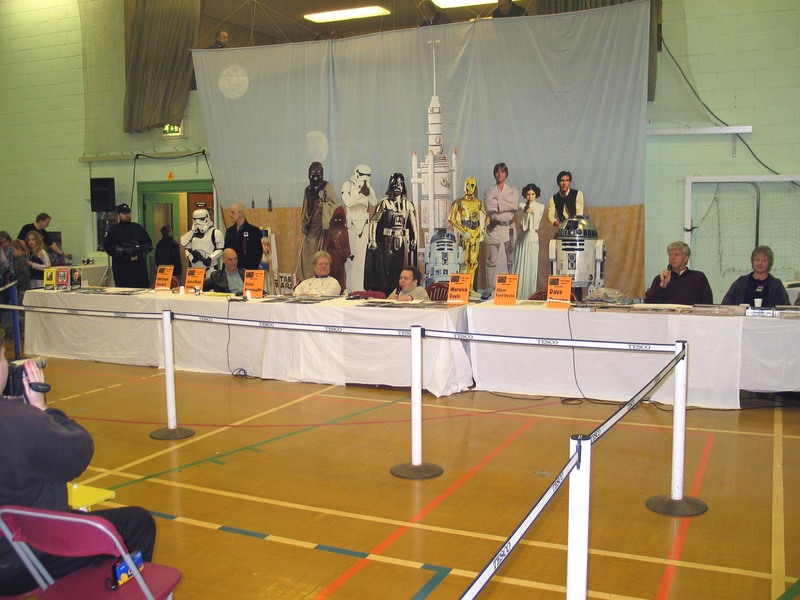 Star Wars Day 8 began with a quick reshuffle of the guest line-up, as unfortunately Oliver Ford Davies (Sio Bibble) was unable to join us on the day. 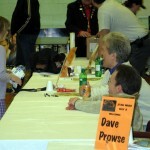 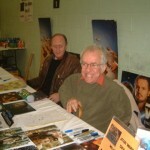 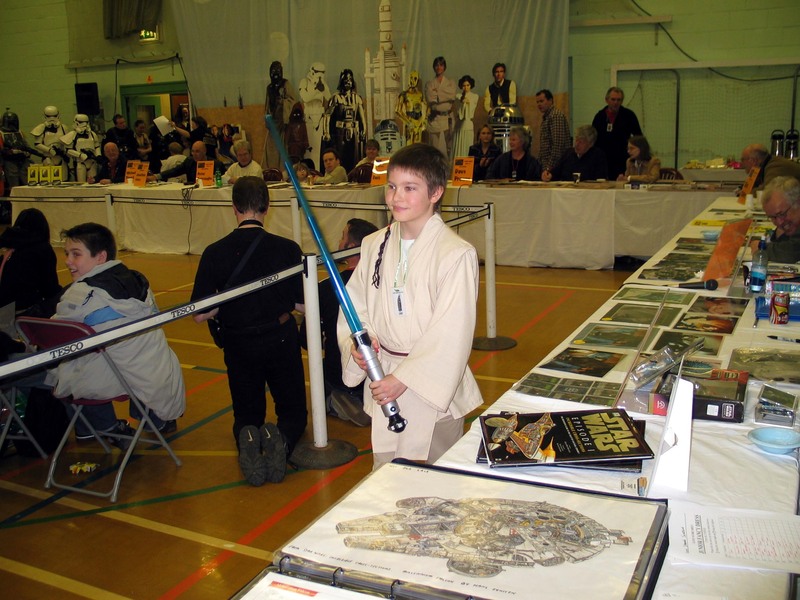 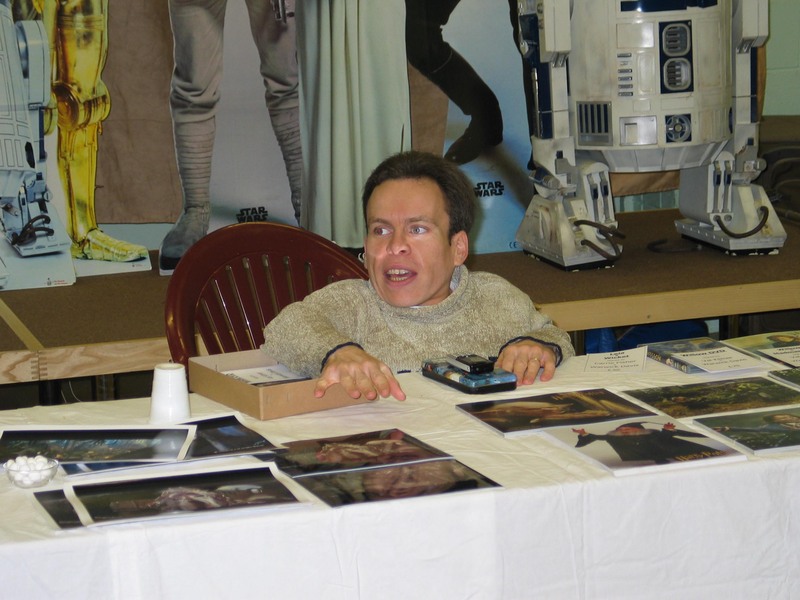 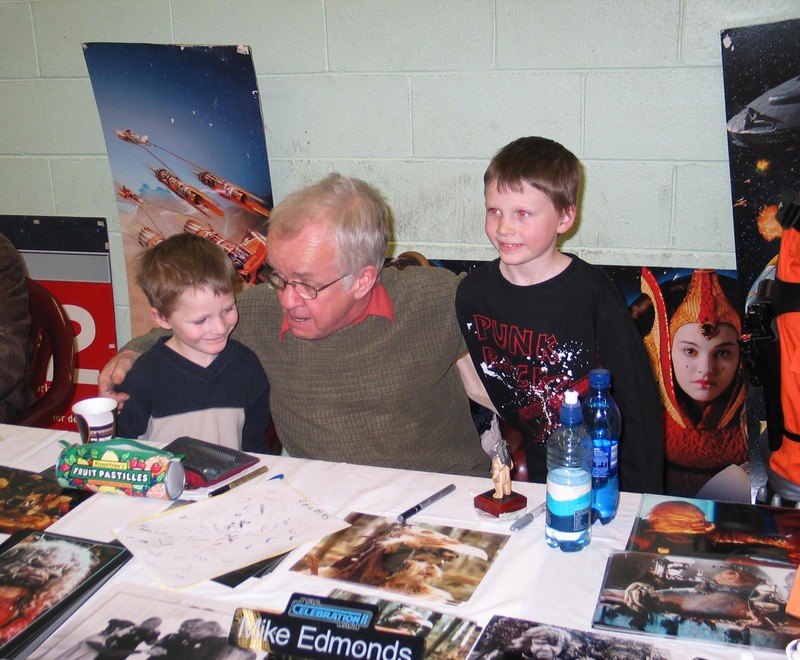 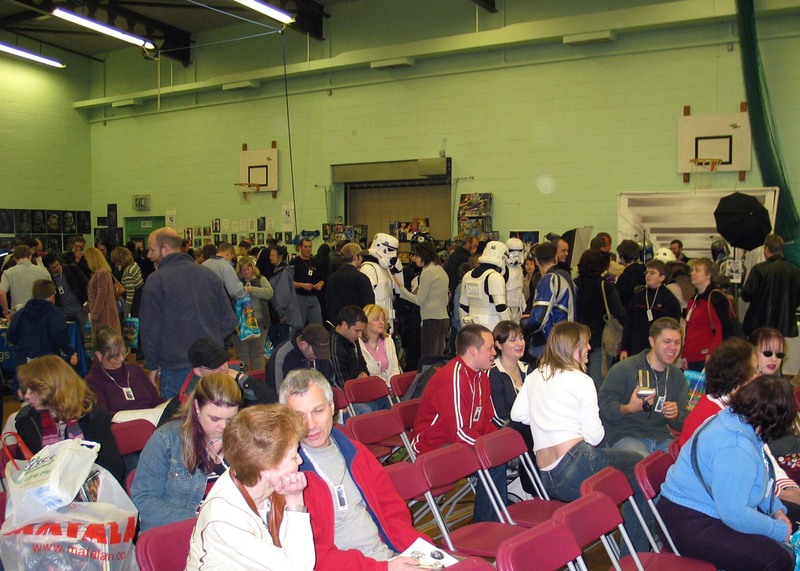 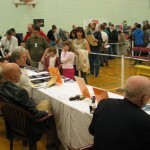 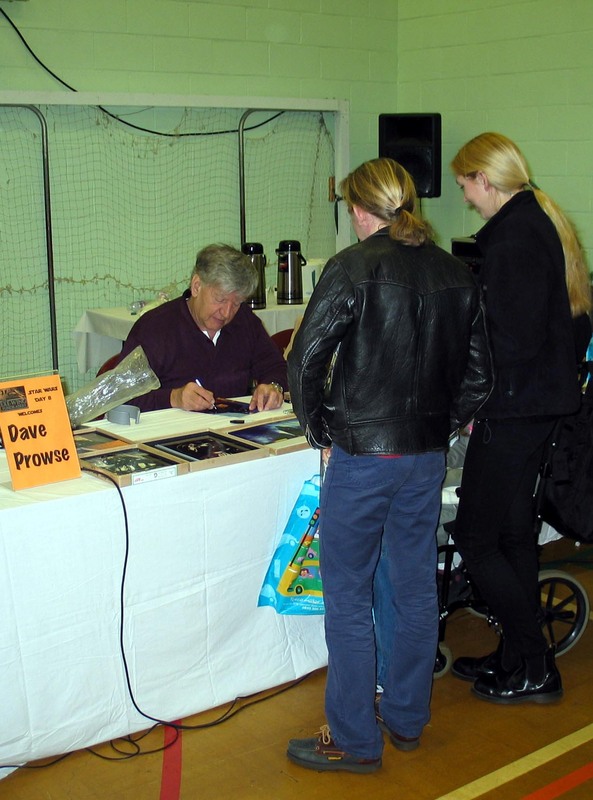 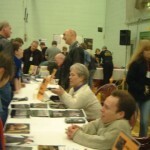 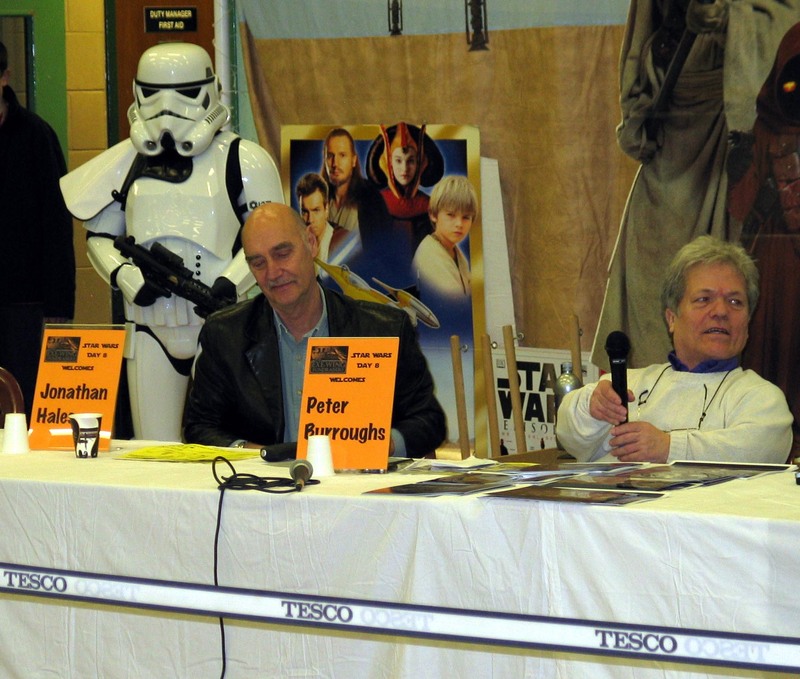 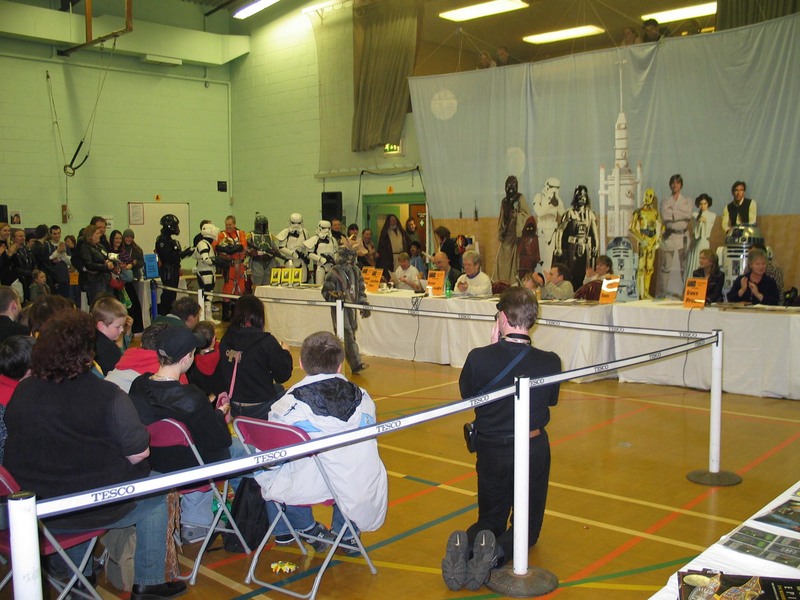 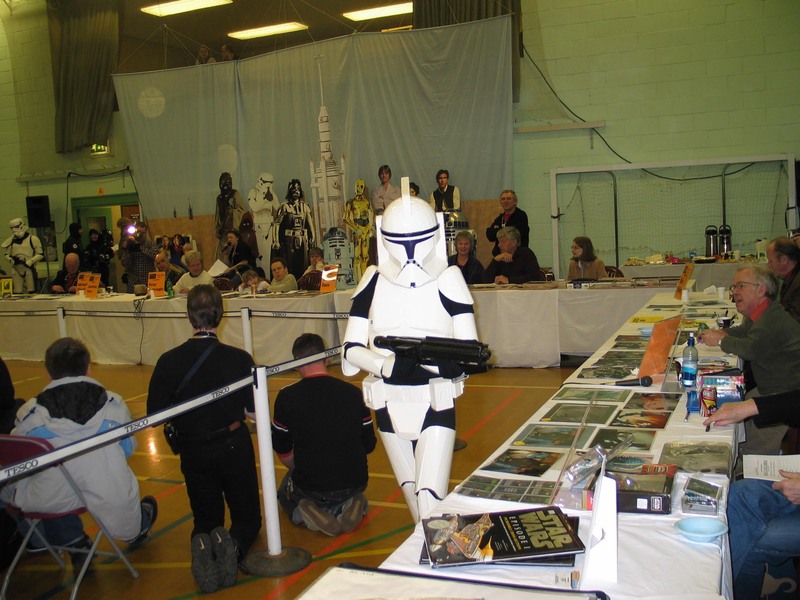 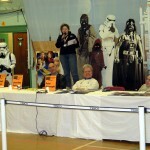 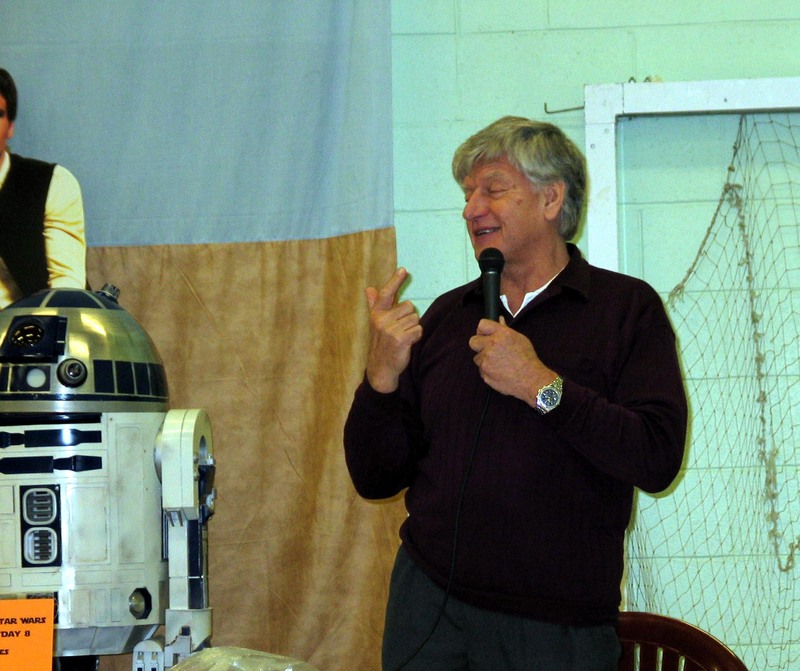 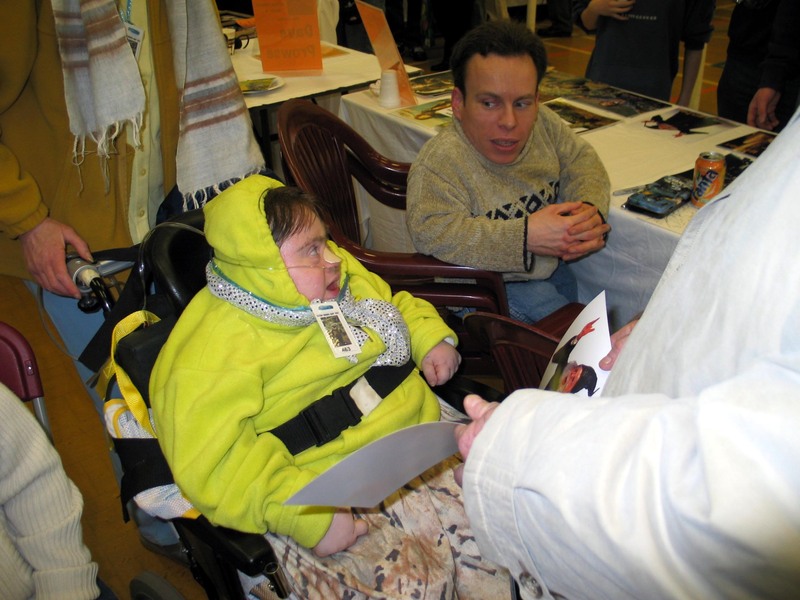 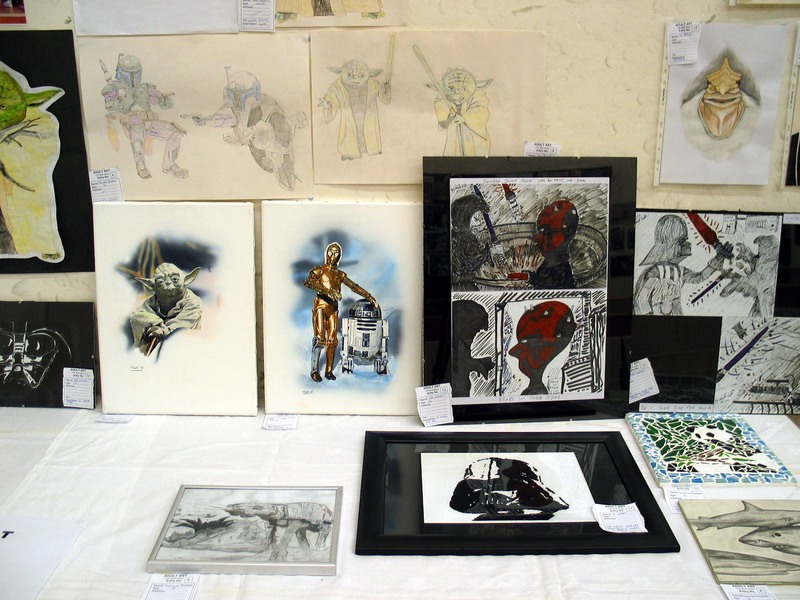 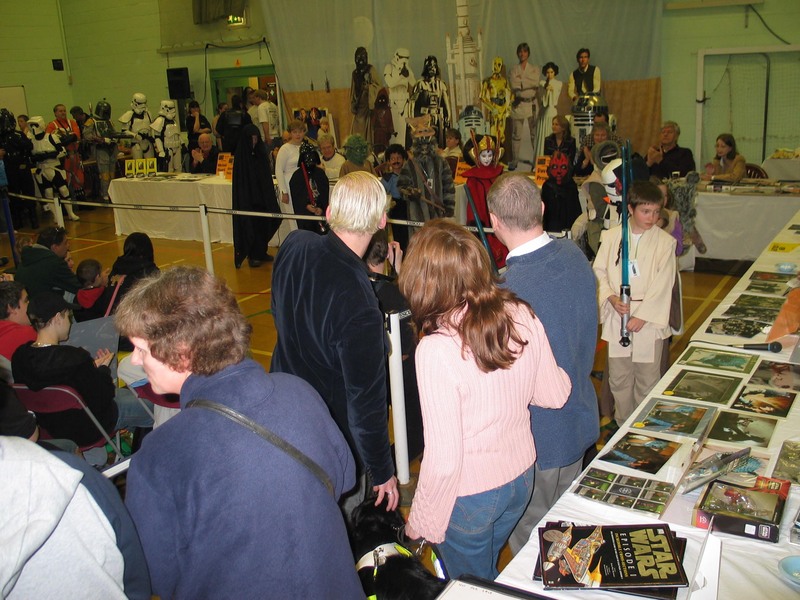 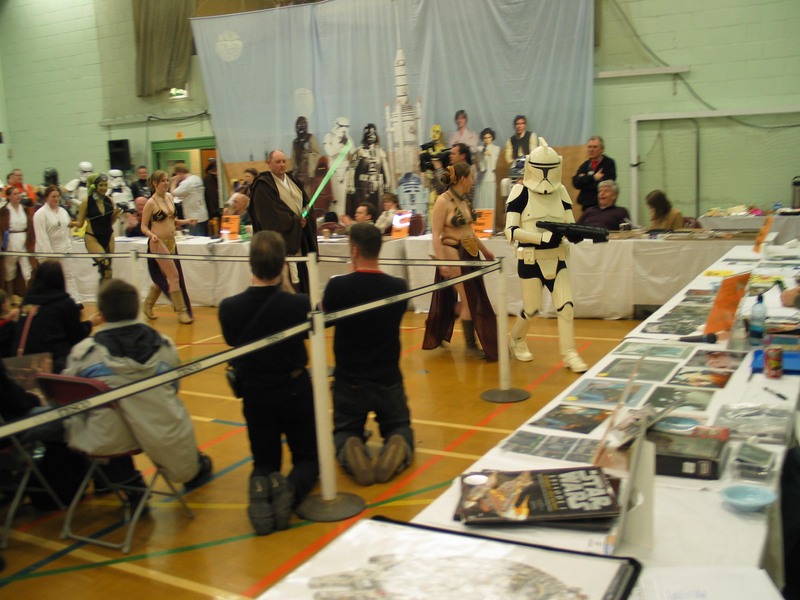 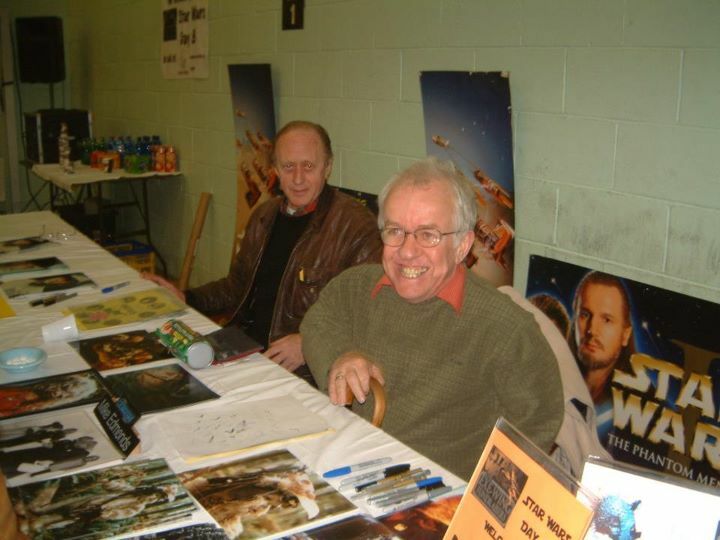 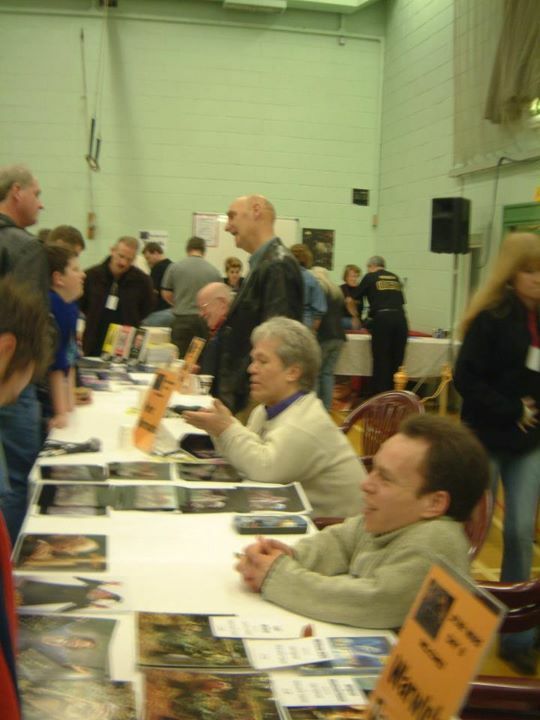 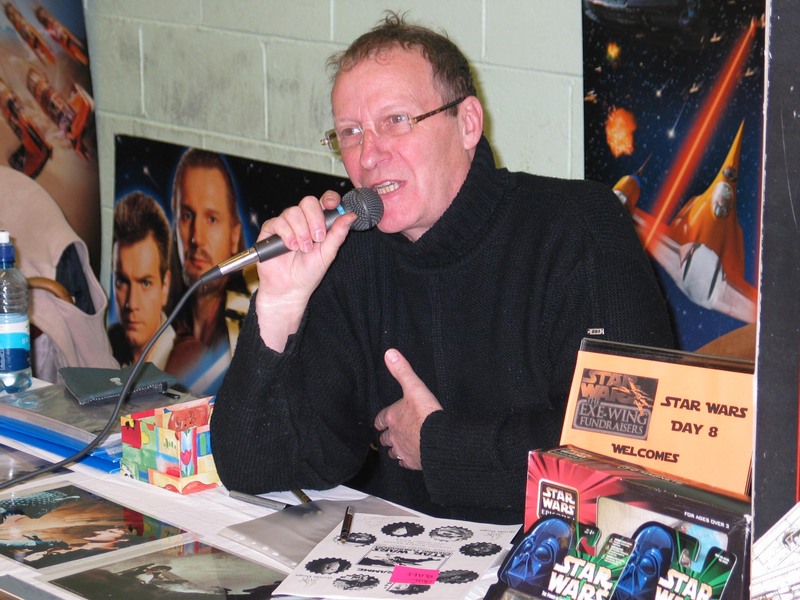 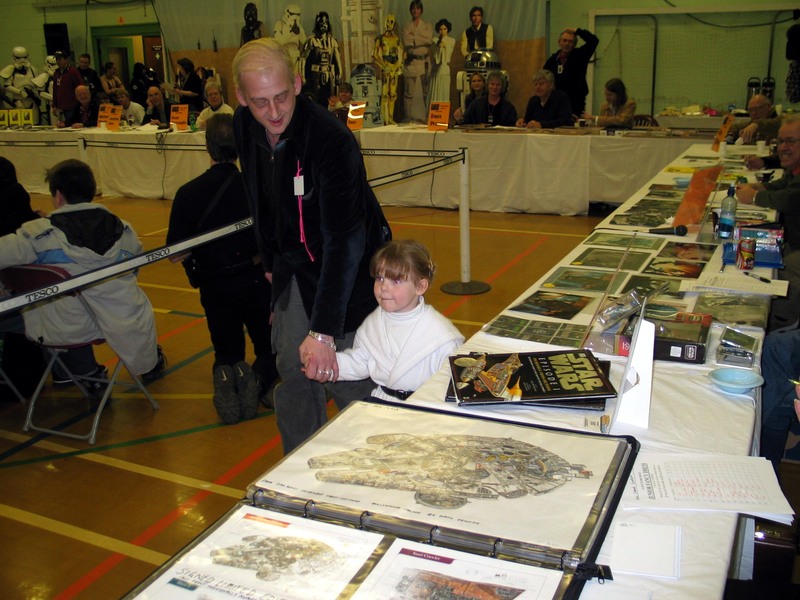 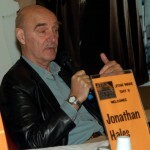 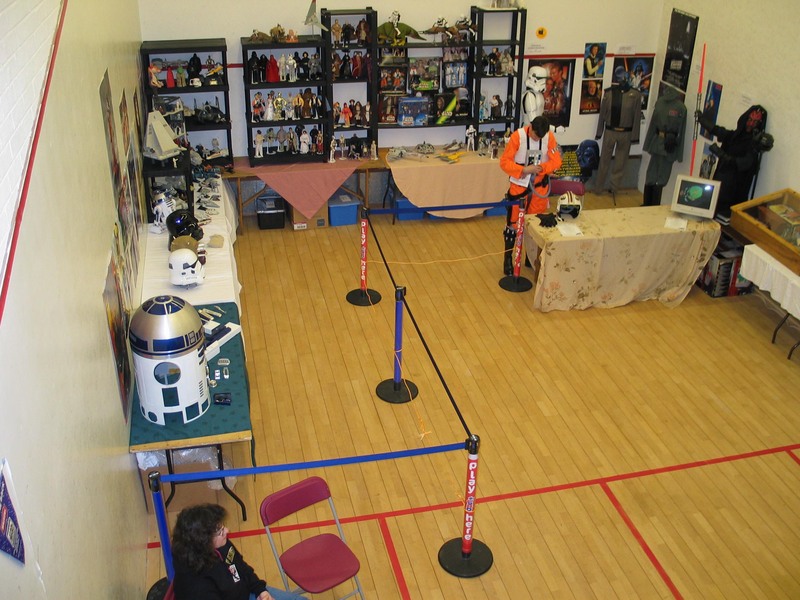 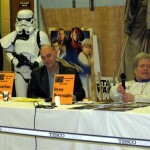 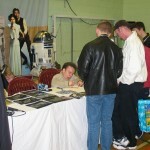 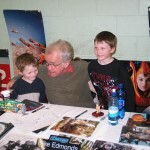 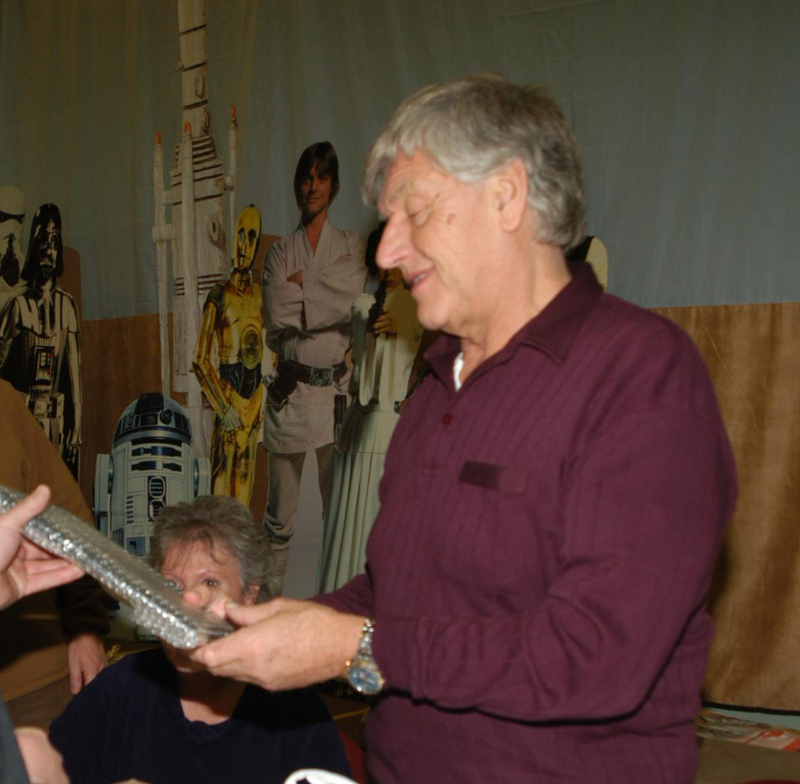 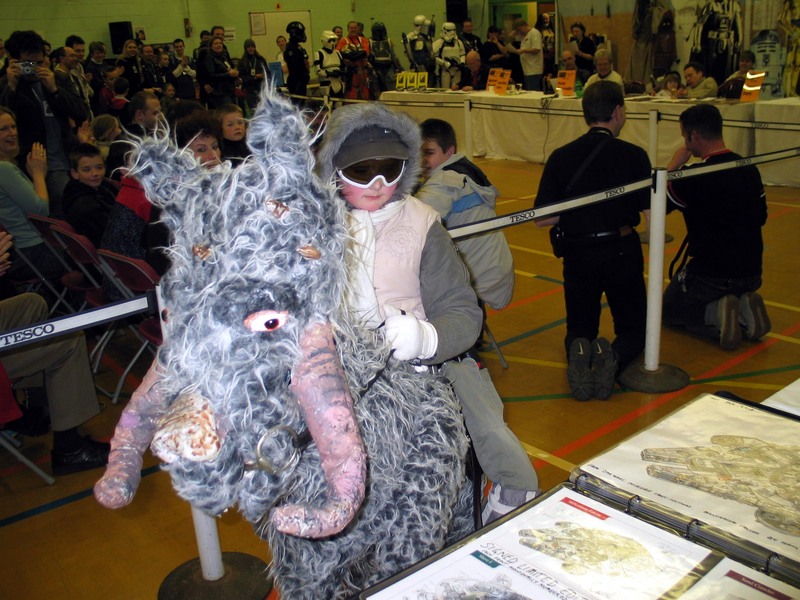 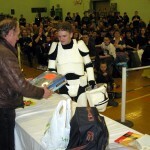 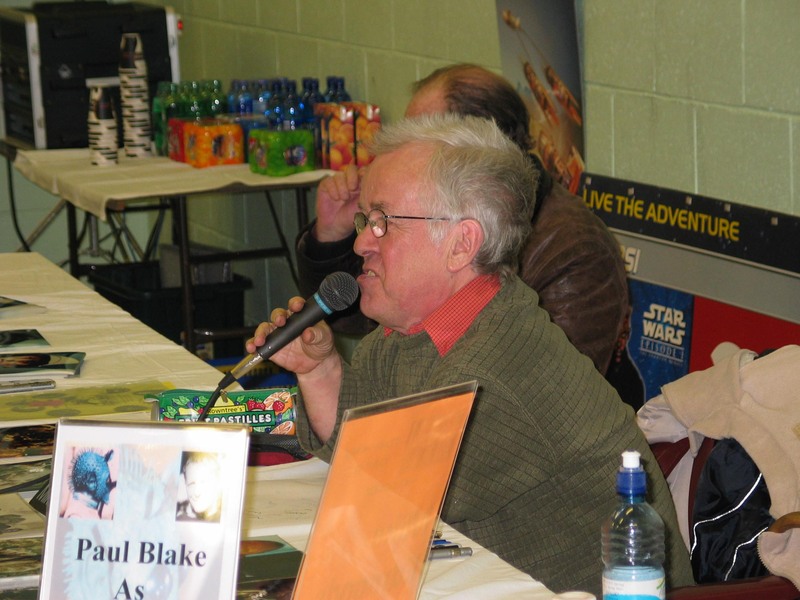 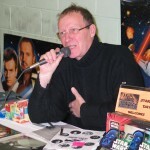 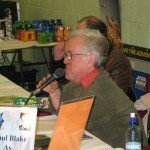 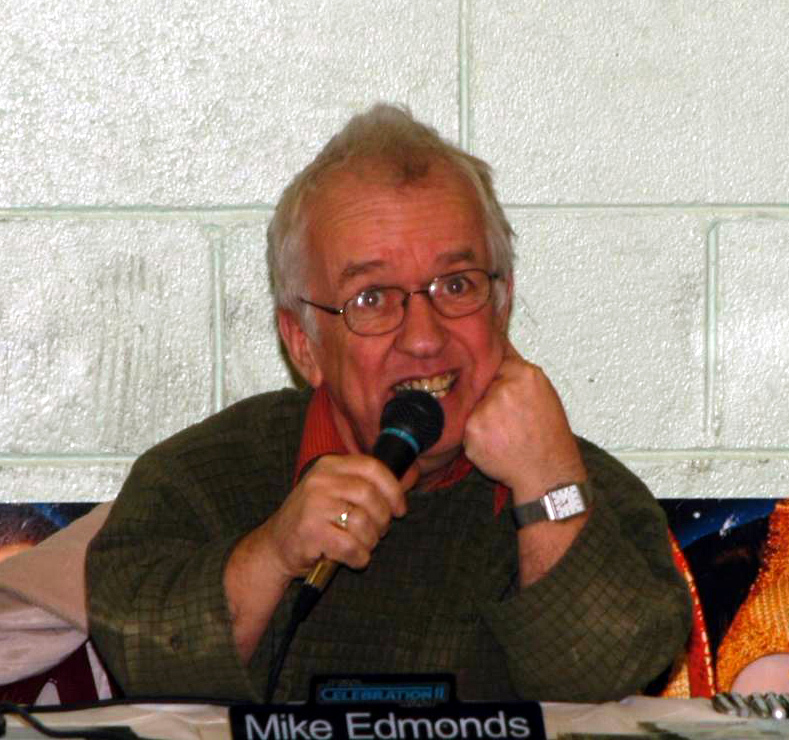 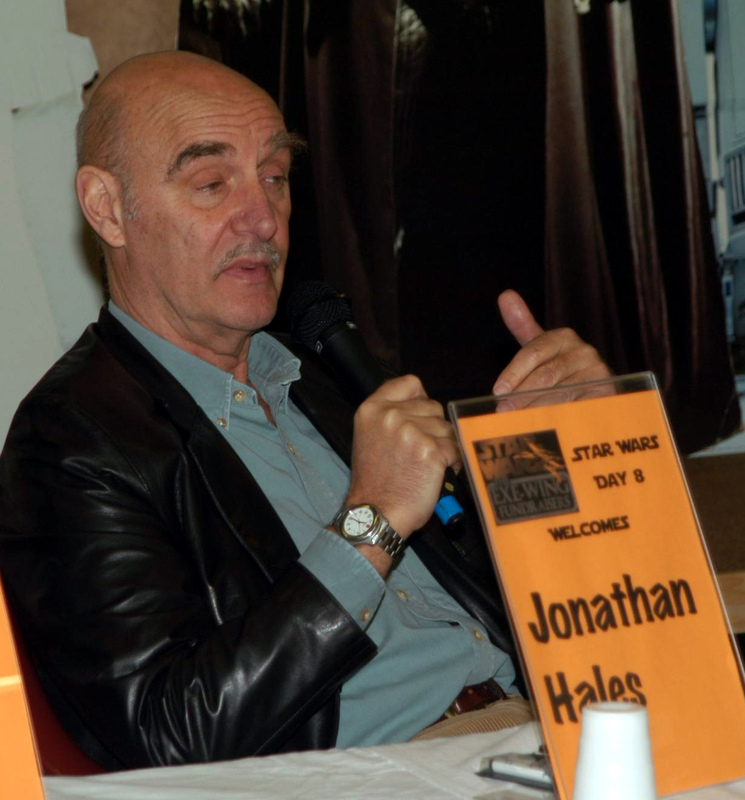 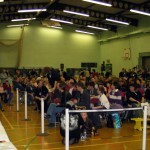 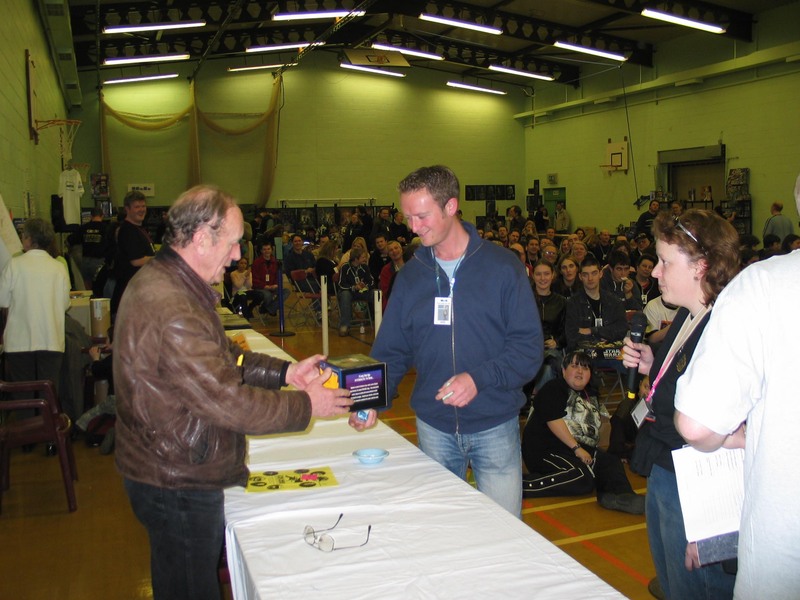 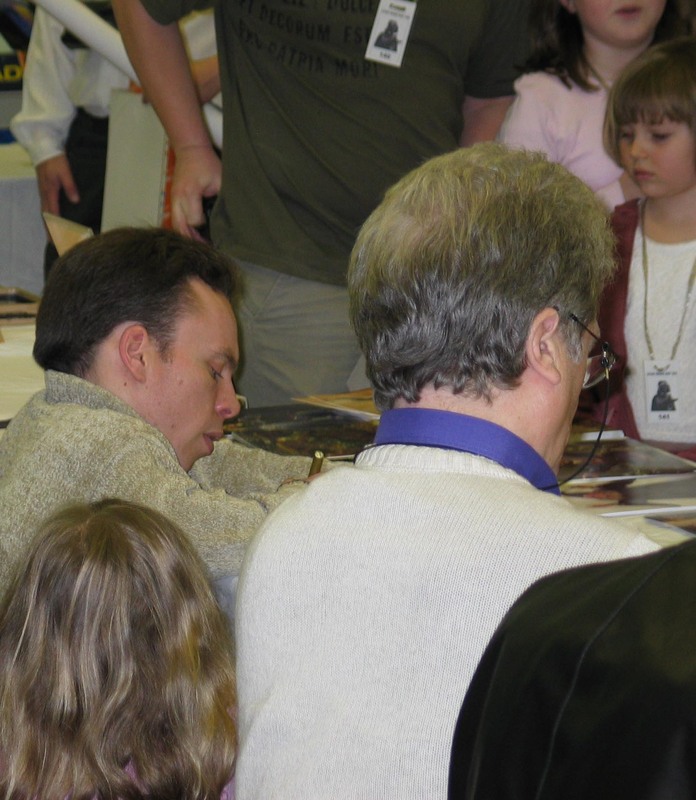 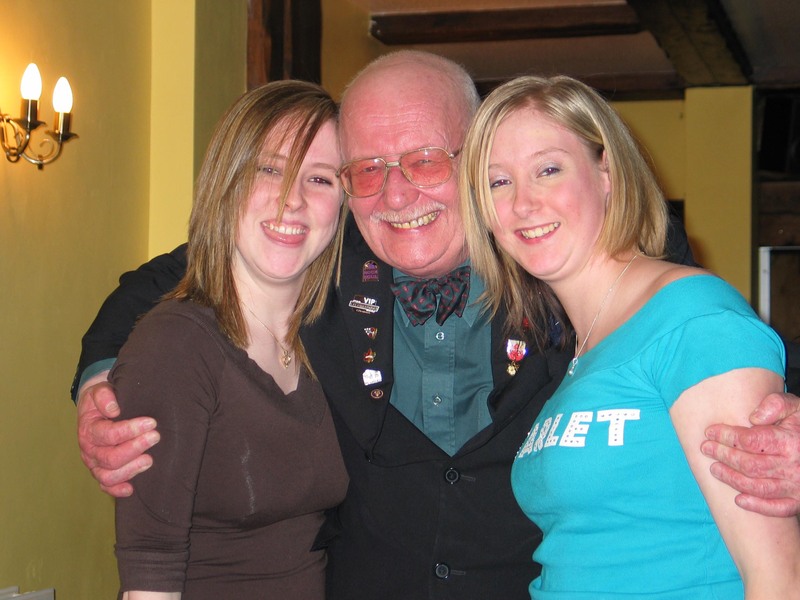 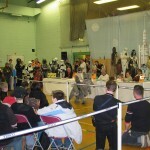 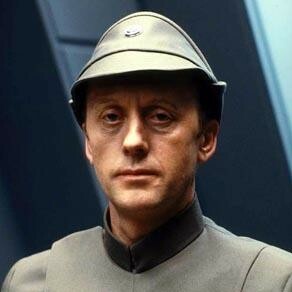 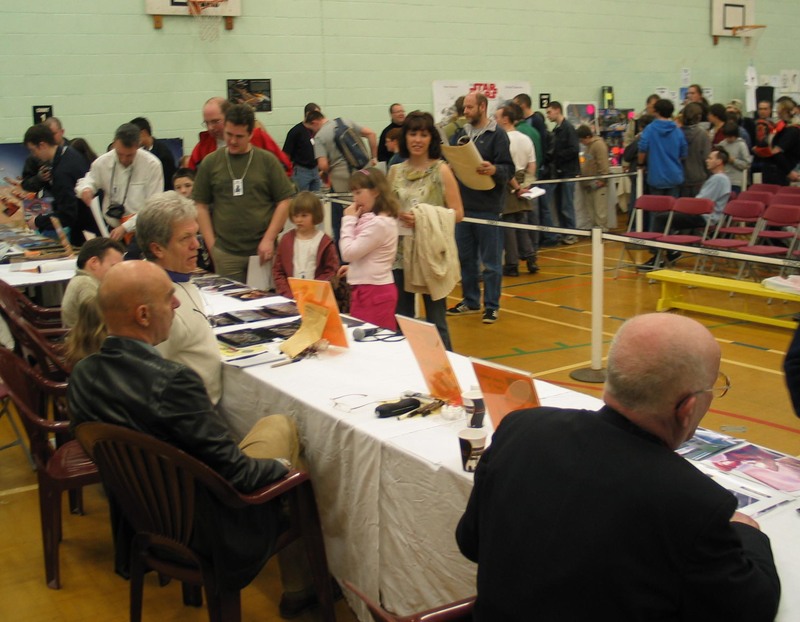 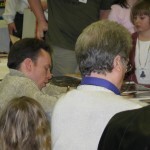 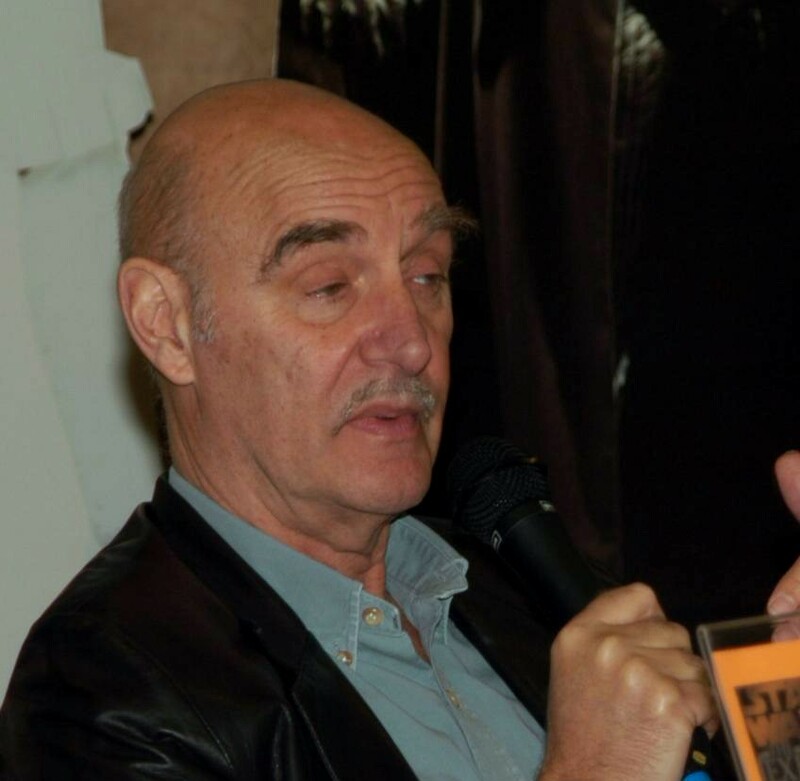 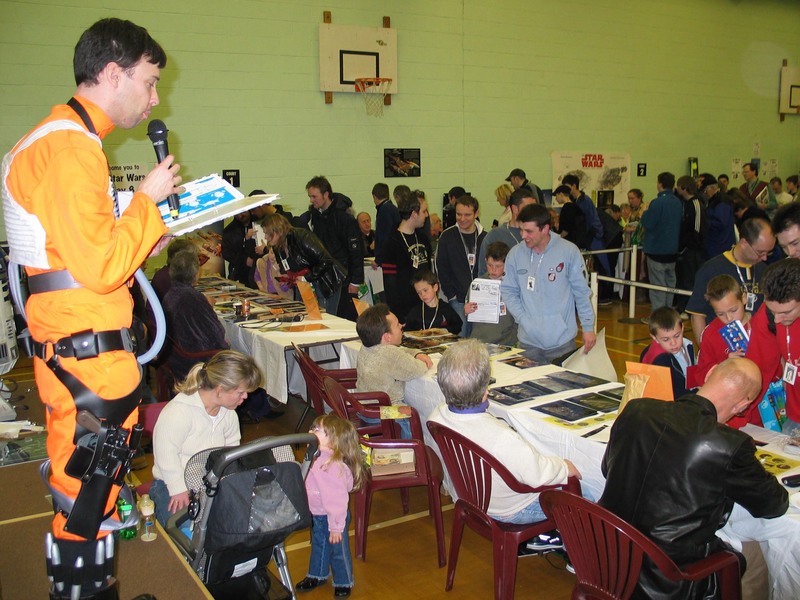 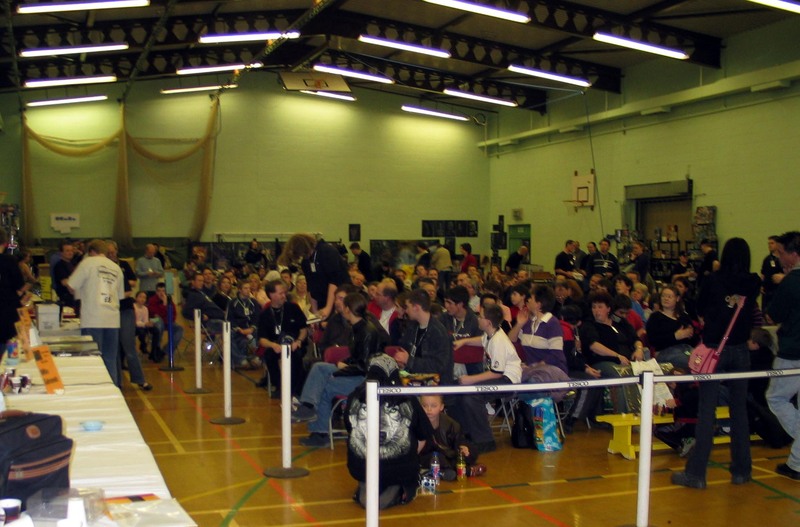 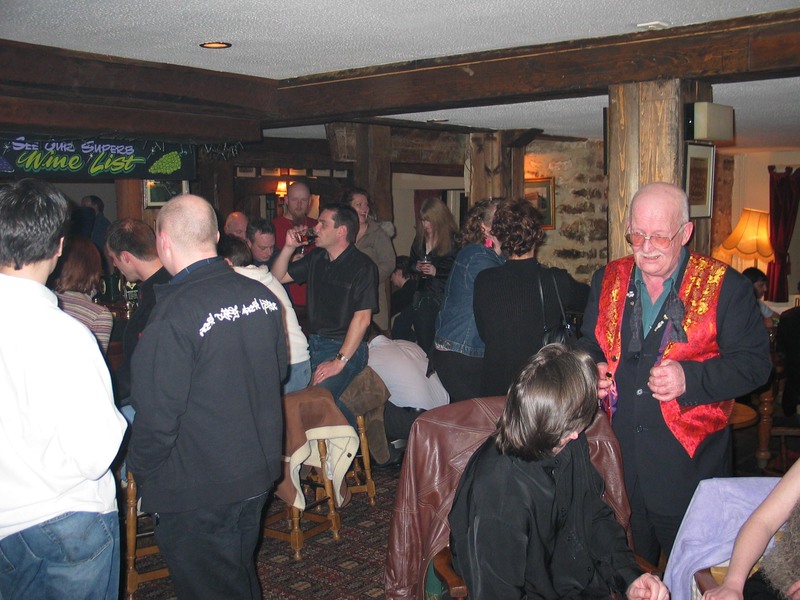 We were not to be disappointed though, as the arrival in Honiton of Peter Burroughs (Stunt Ewok) and Paul Blake (Greedo) brought our line-up to a total of eight guests. 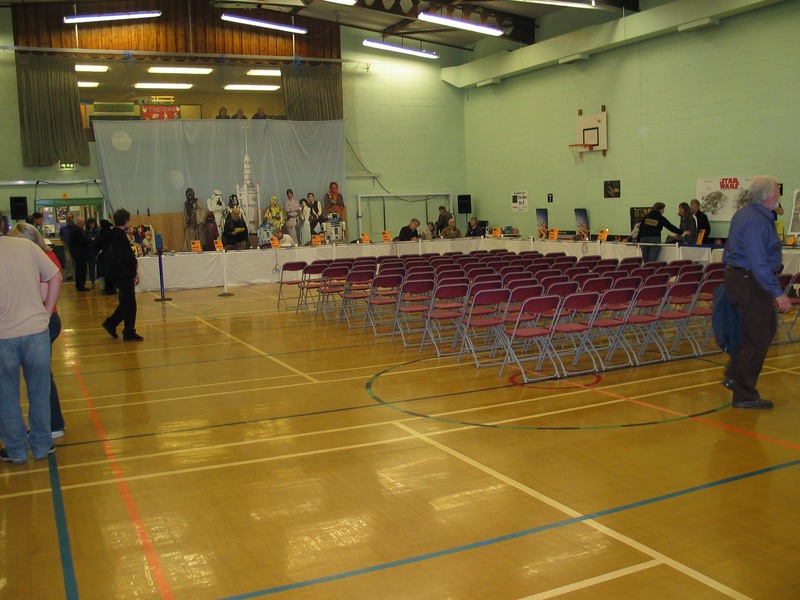 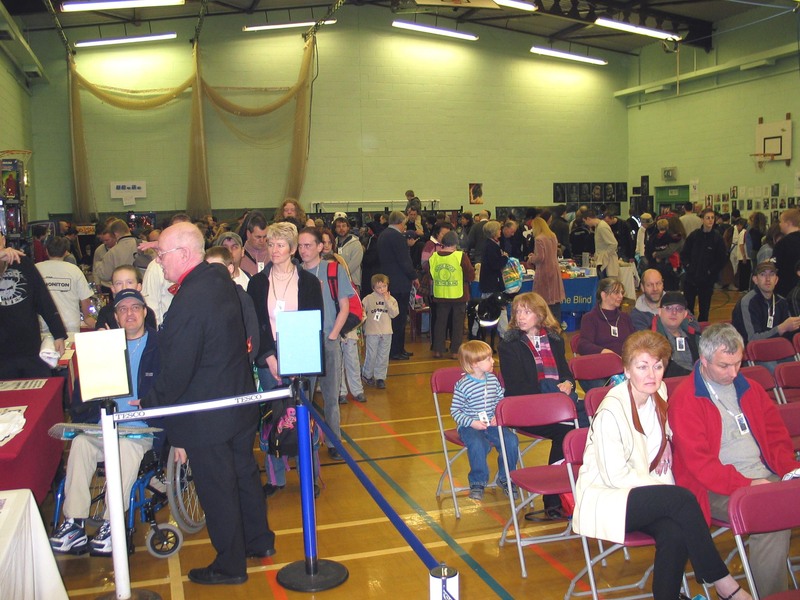 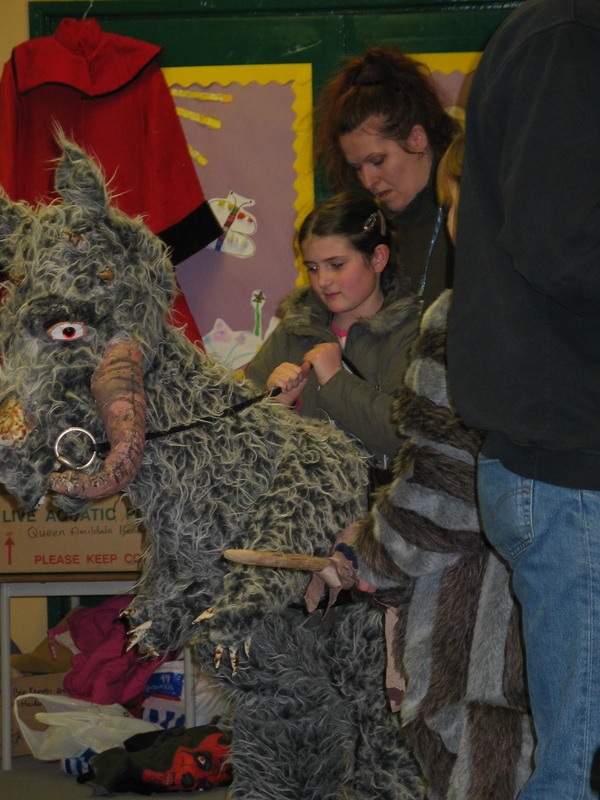 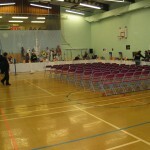 The guests arrived at the Honiton Sports Centre in the bright sunshine to find the Exe-Wingers and Stewards in the final stages of setting up the halls, having started this frantic activity at 6:30 am! 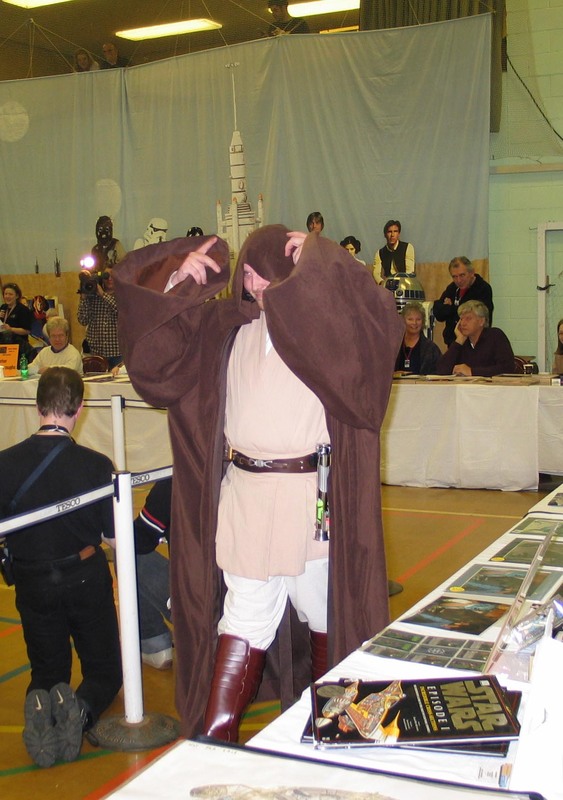 The indefatigable Michael Sheard (Admiral Ozzel) arrived first at the Sports Centre, his usual jovial self even at that early hour. 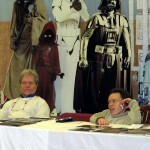 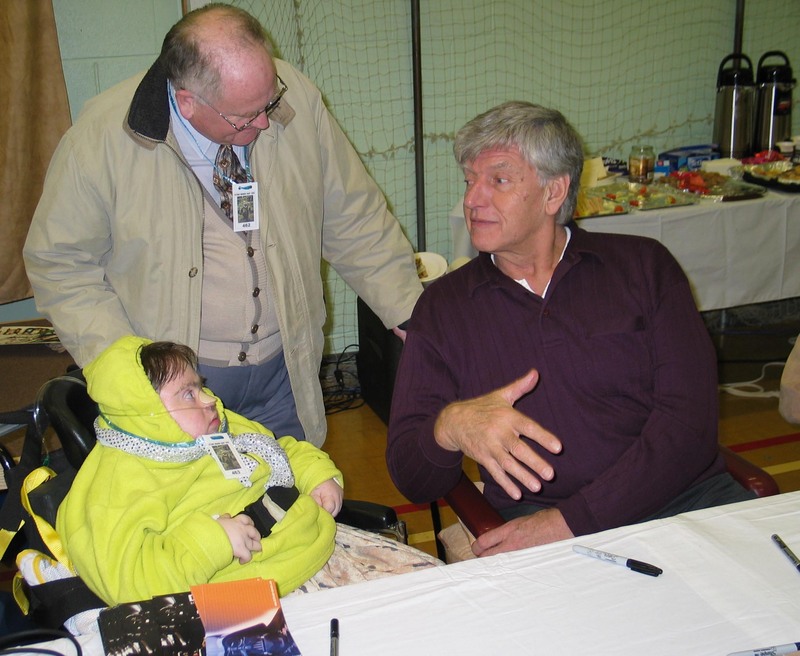 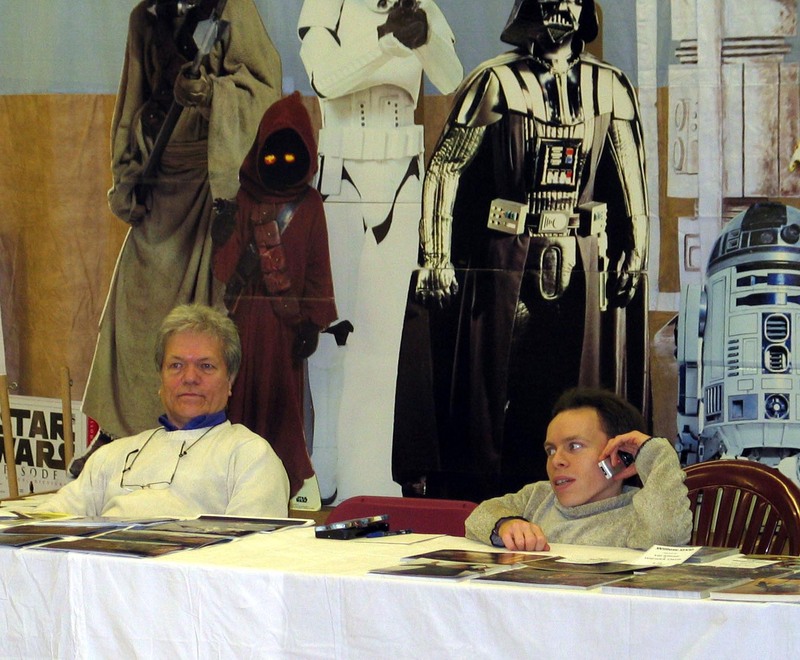 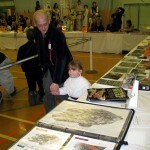 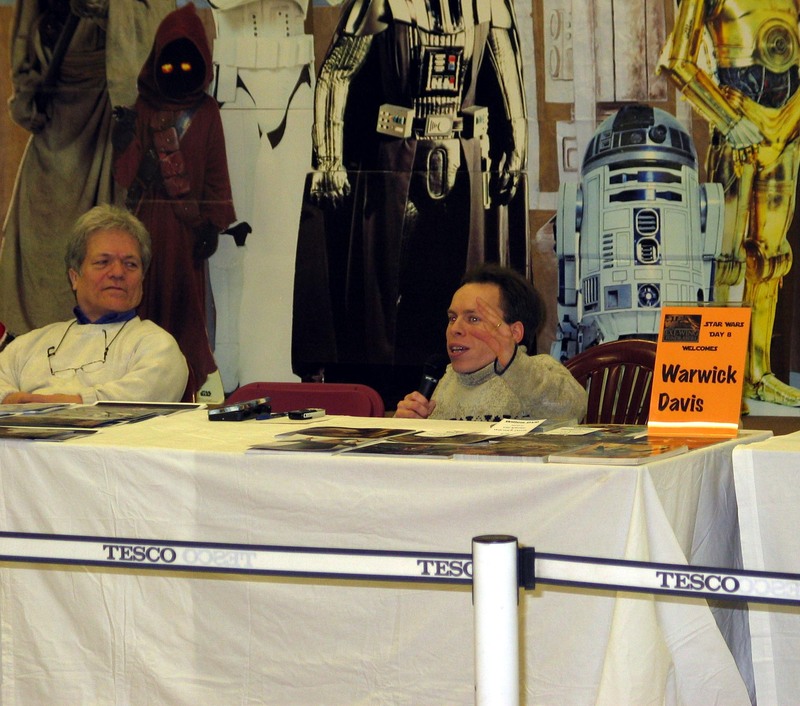 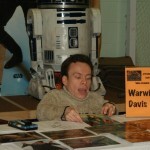 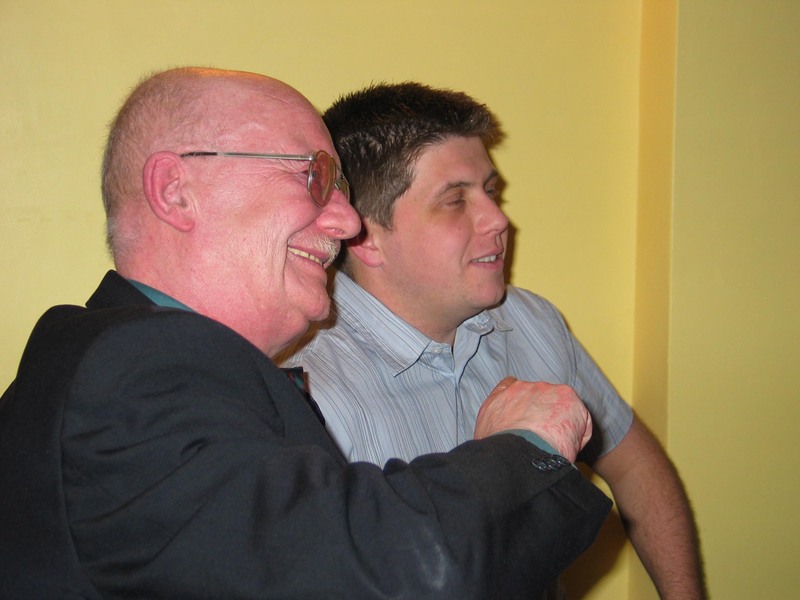 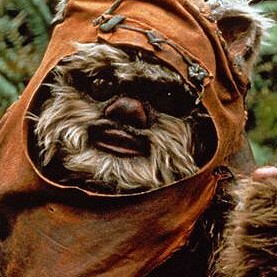 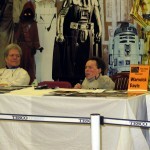 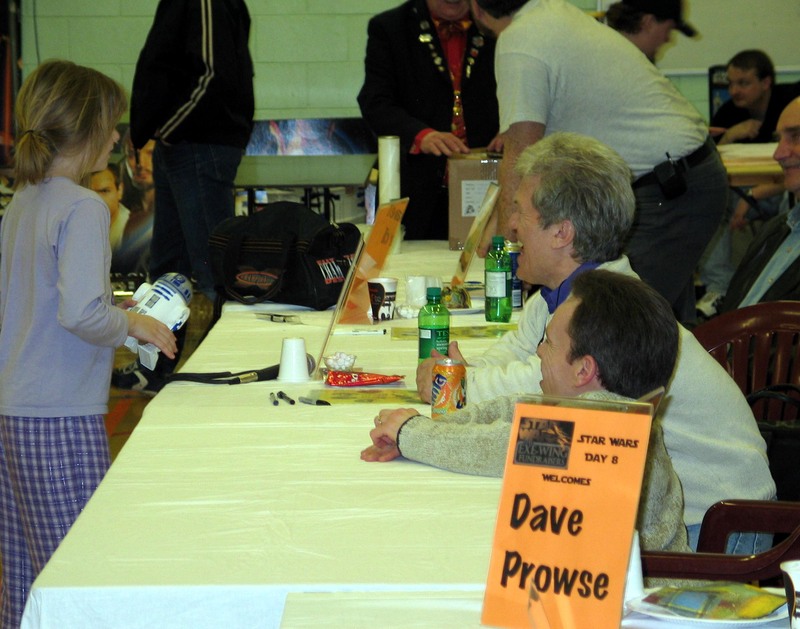 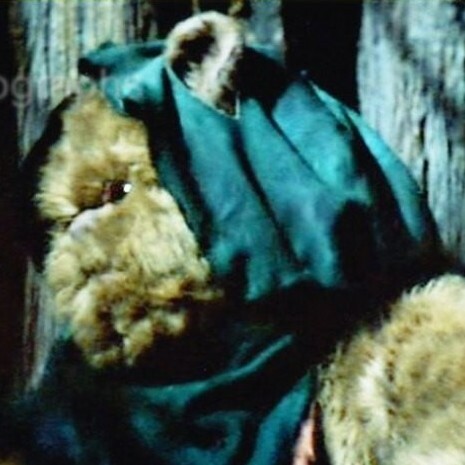 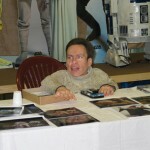 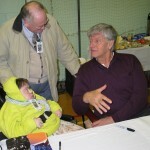 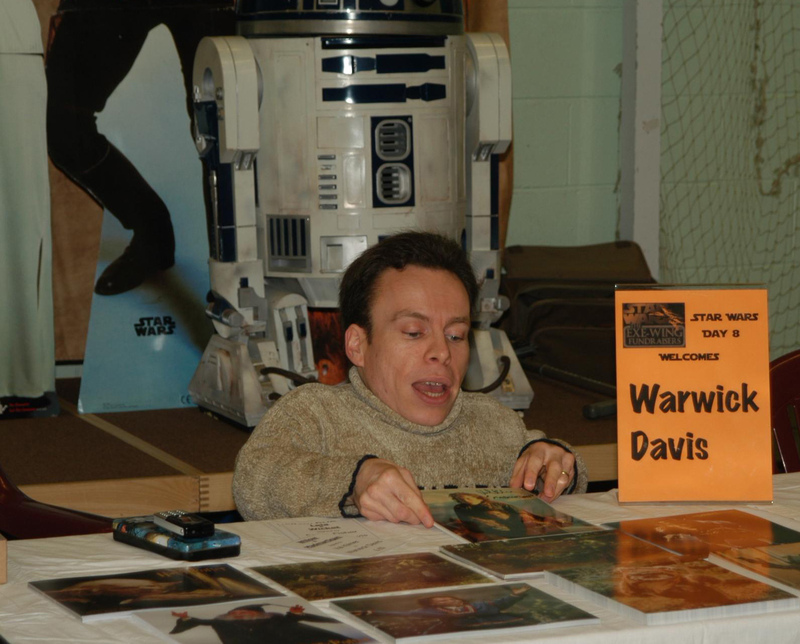 He was soon joined by Dave Prowse (Darth Vader), Jonathan Hales (Ep2 Screenwriter), Warwick Davis (Wicket), Mike Edmonds (Logray) and Peter Burroughs. 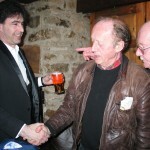 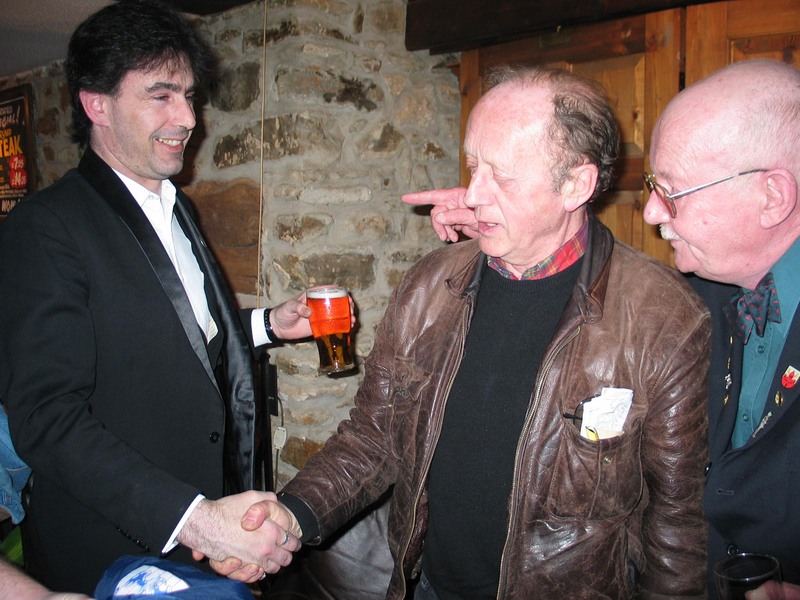 Unfortunately Ken Colley (Admiral Piett) and Paul Blake were delayed by car trouble, but arrived shortly after the opening time. 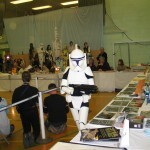 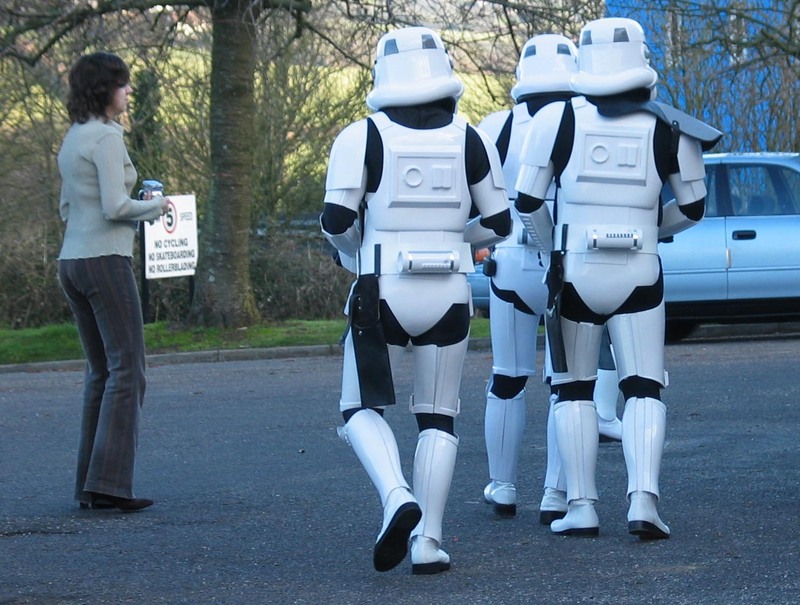 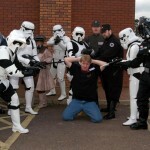 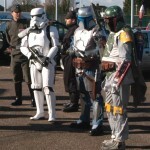 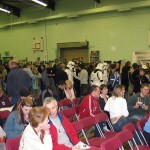 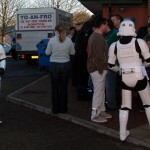 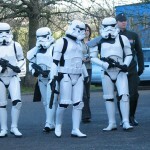 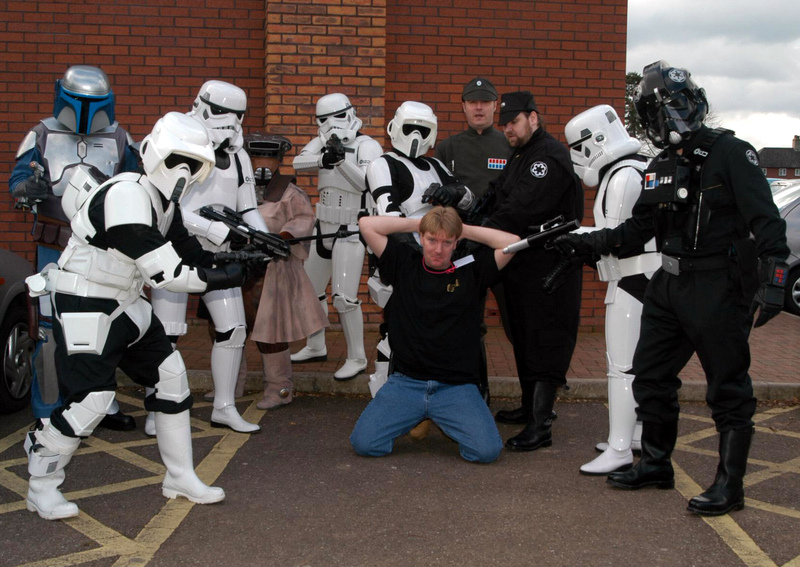 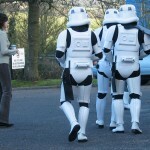 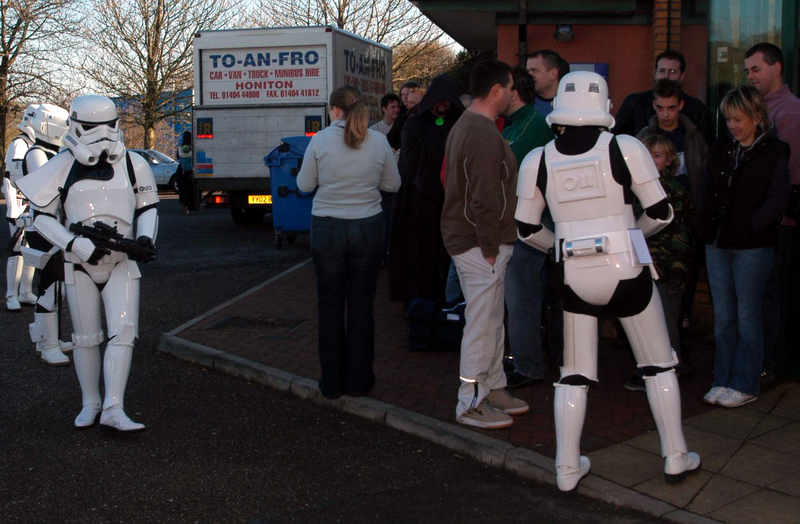 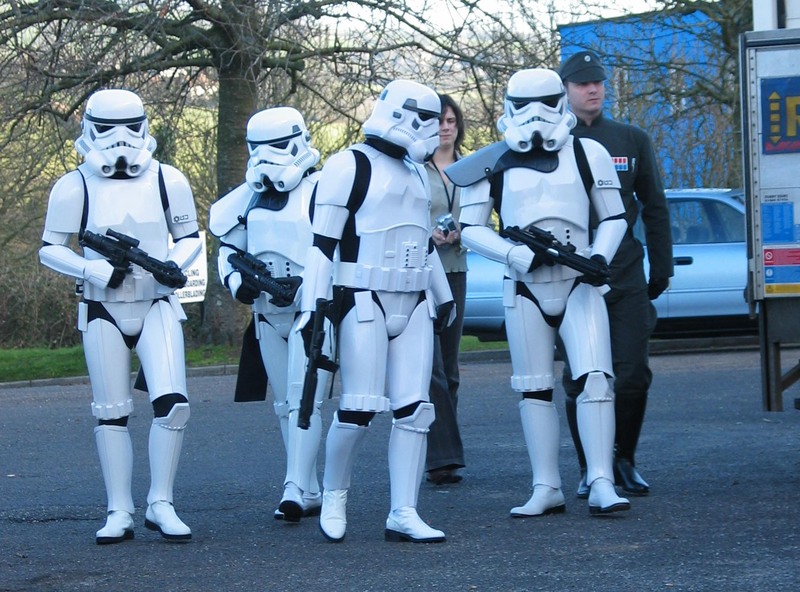 The first attendees had been lining up at the doors well ahead of the guests arrival, being kept entertained by the loyal troopers of the UK Garrison, who were conducting their own brand of security operations in the car park. 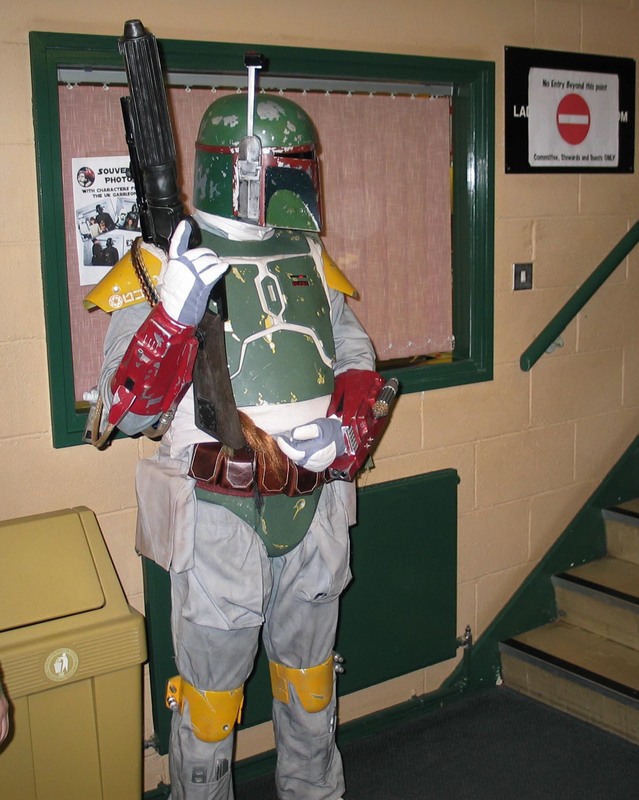 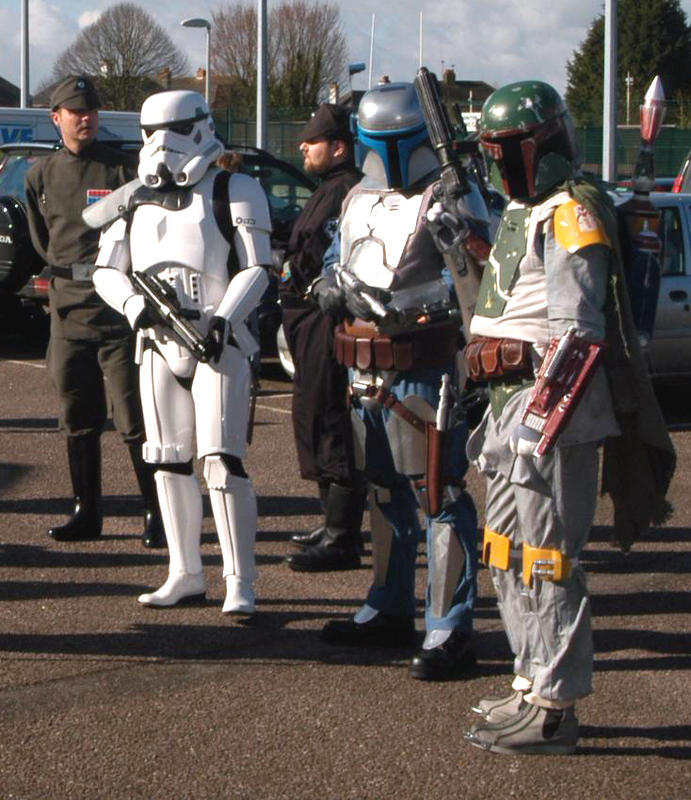 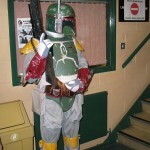 This time the Imperials had brought some of their friends, with Boba Fett and father Jango, fellow bounty hunter Boushh, and even a Rebel Pilot making a welcome appearence in Honiton. 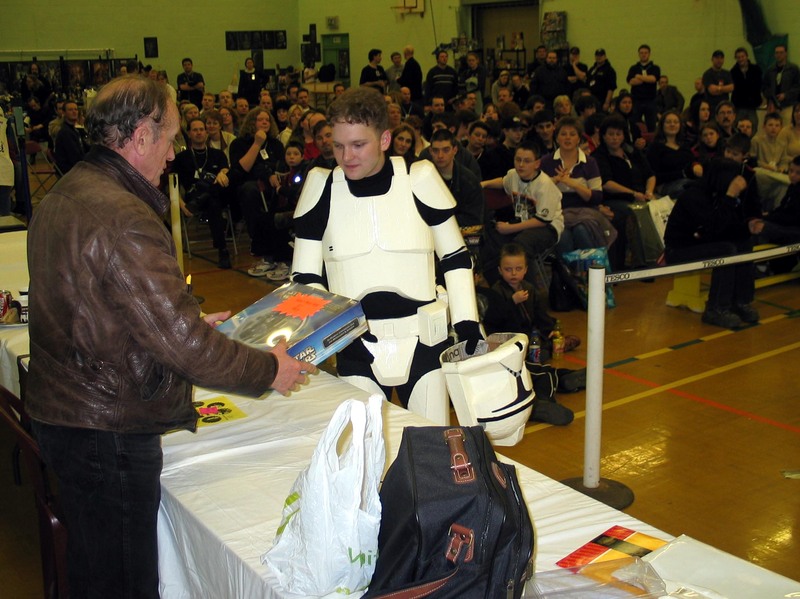 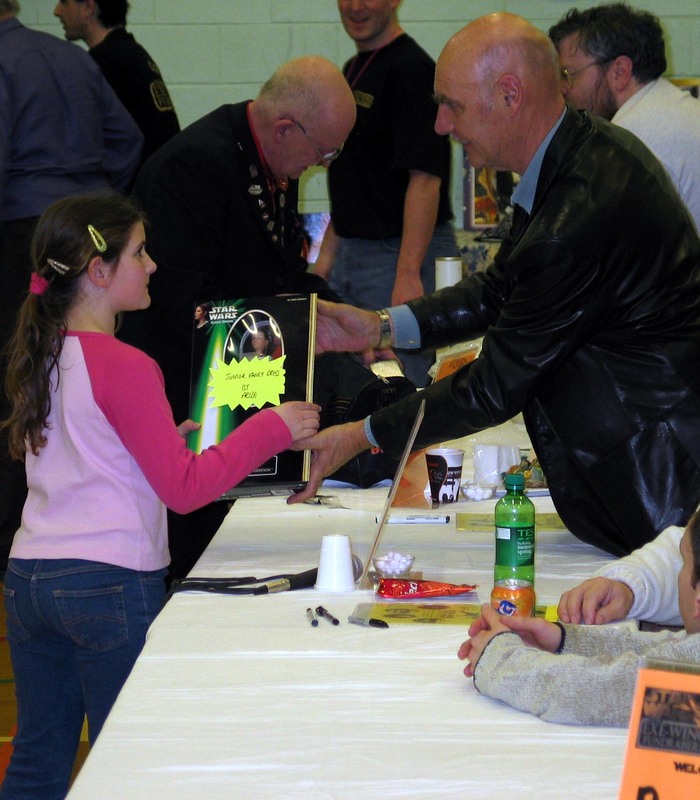 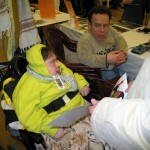 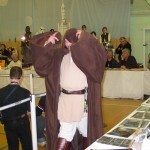 A little after 10:30 the doors opened and the attendees filed in to head for the dealer tables, stocked with Star Wars and other memorabila past and present. 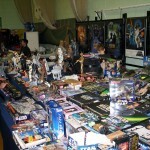 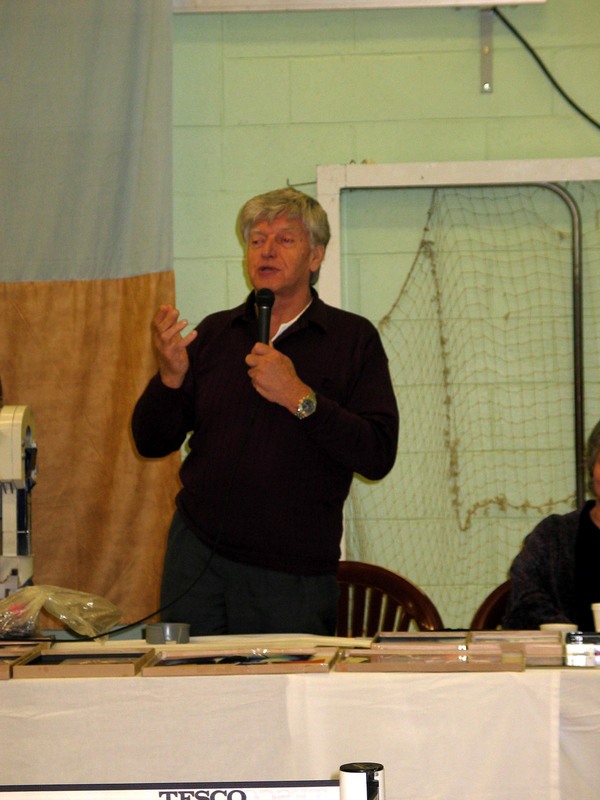 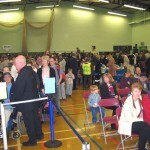 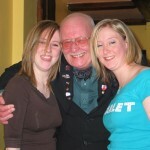 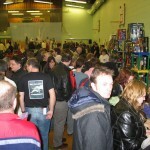 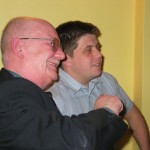 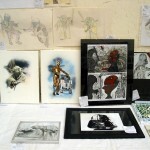 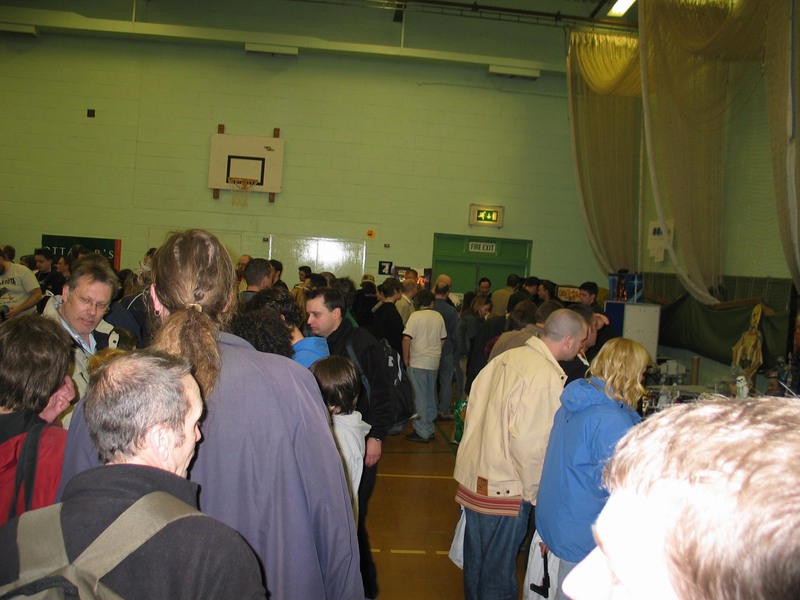 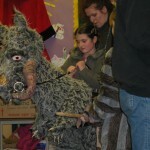 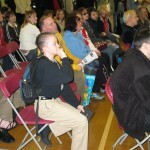 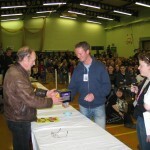 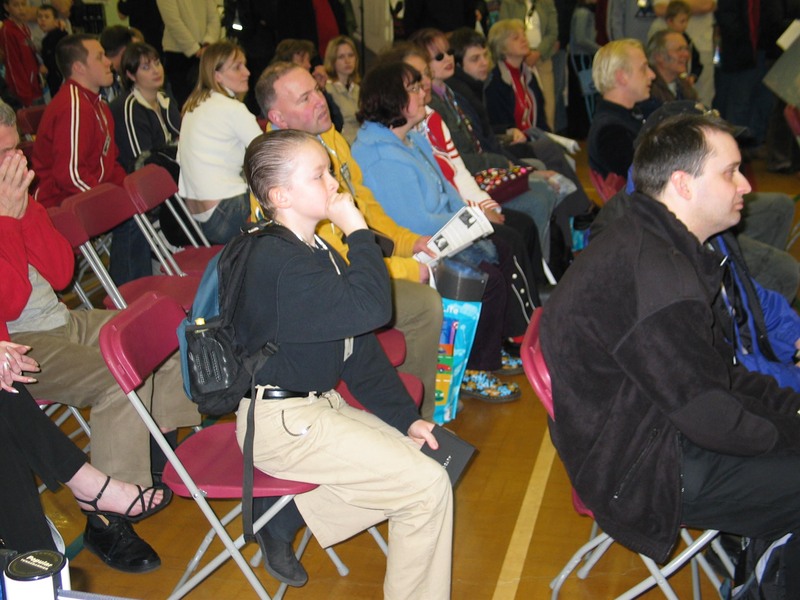 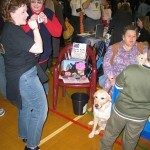 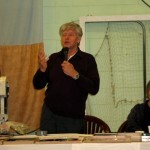 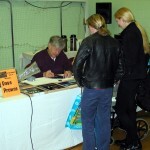 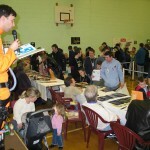 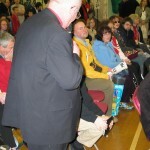 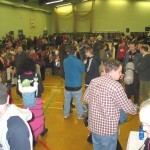 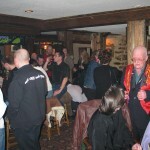 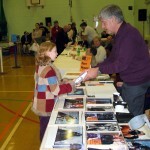 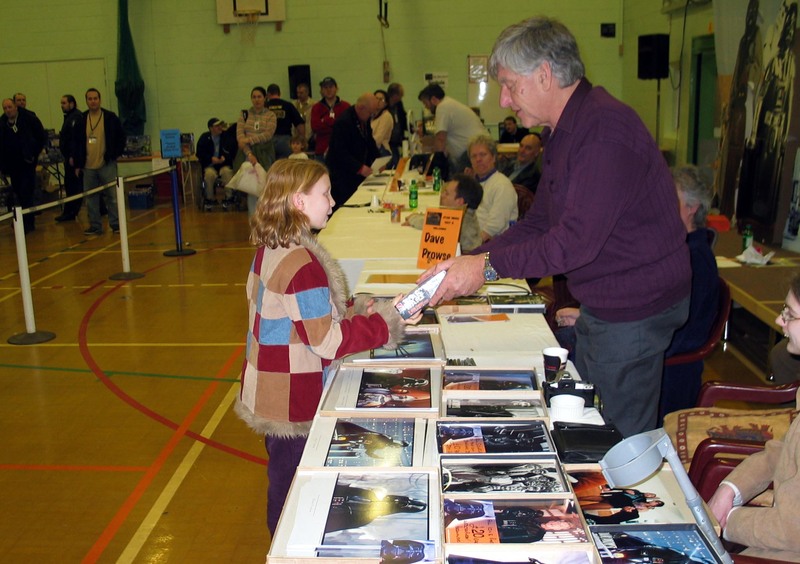 The Grande Raffle did good business all day, as did the tombola, each boasting an excellent array of prizes to be won. 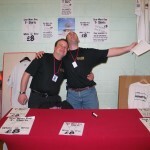 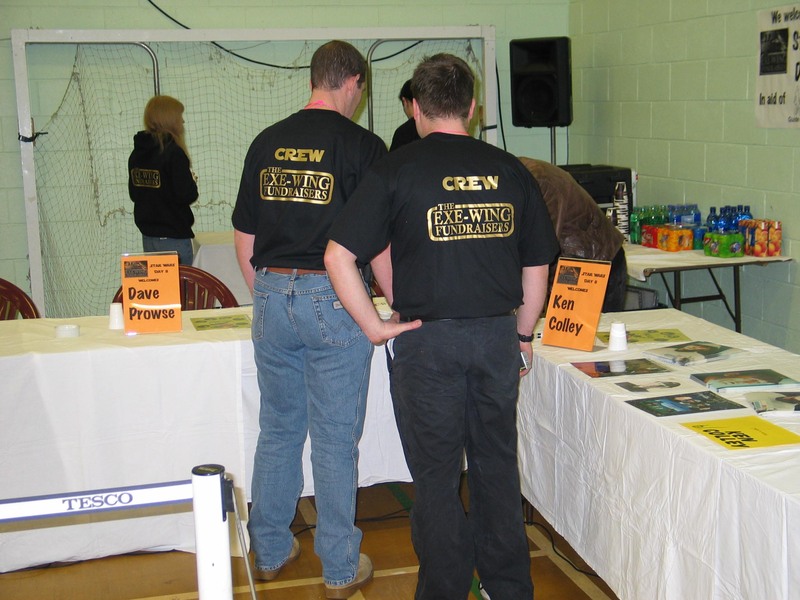 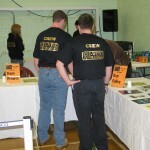 A new addition this year was the T-shirt stand where the Exe-Wing Commitee members Bruce and Jonathan did their best impressions of Del-Boy and Rodney, selling shirts left, right and centre, to all and sundry! 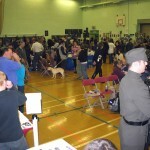 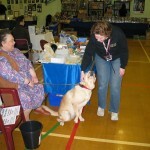 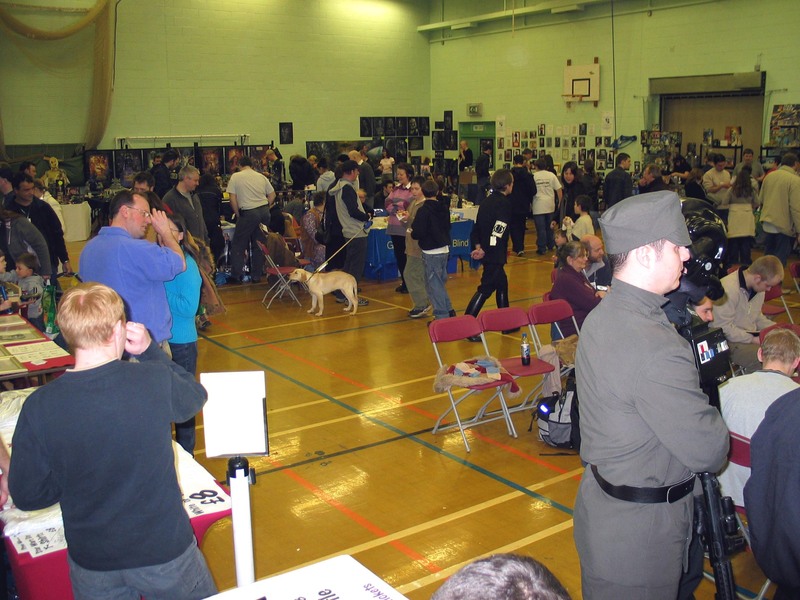 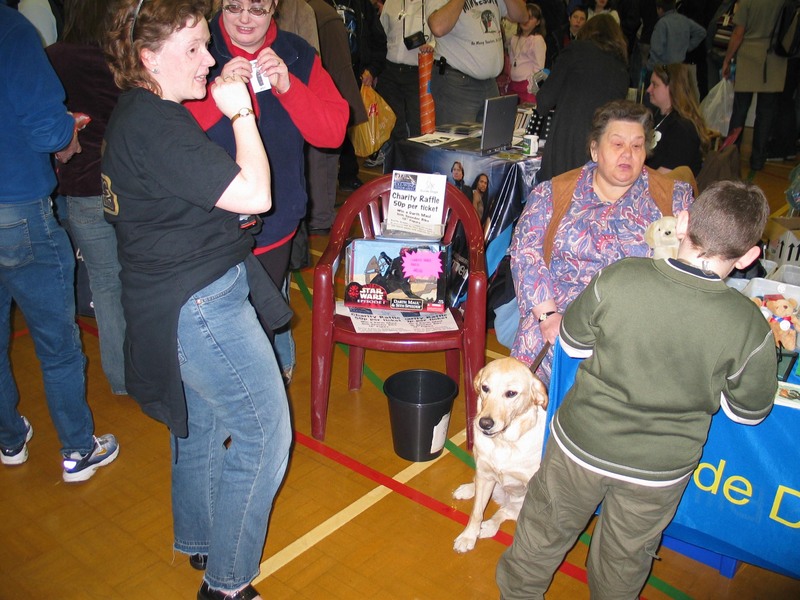 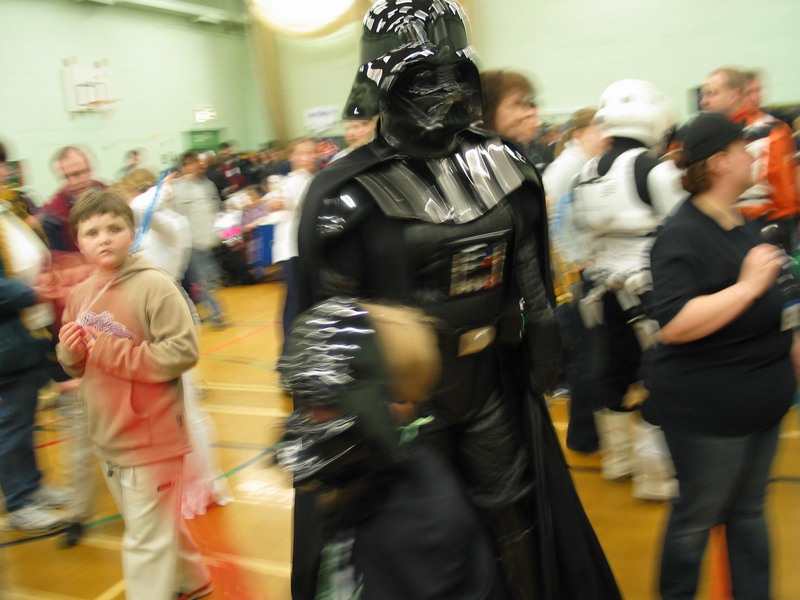 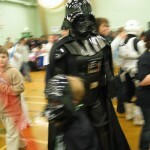 Lest we forget what the day was really about, the Guide Dogs for the Blind Association were in attendance all day, with a stall and raffle, several lovely dogs, and even a guide dog puppy in training – enough to soften even the black heart of Lord Vader! 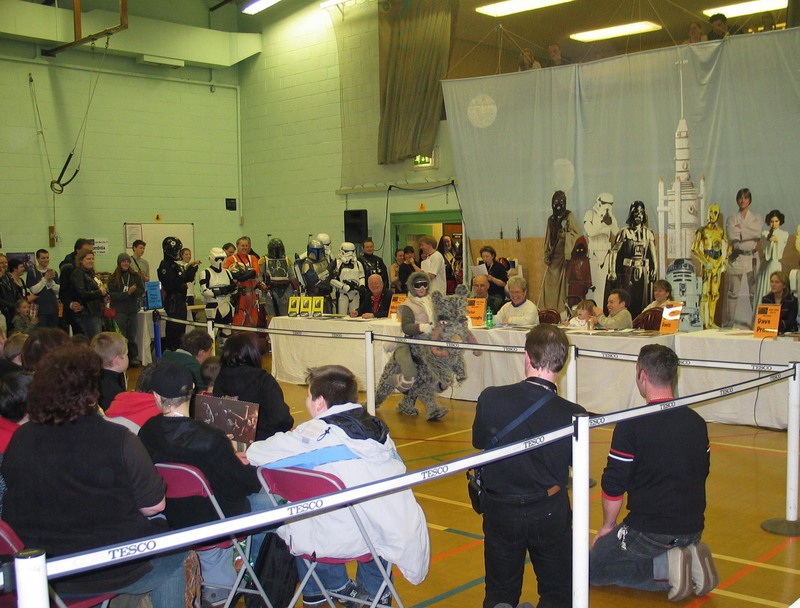 The question and answer sessions proved to be as popular as ever, with some excellent questions being asked that provoked some interesting responses from the special guests. 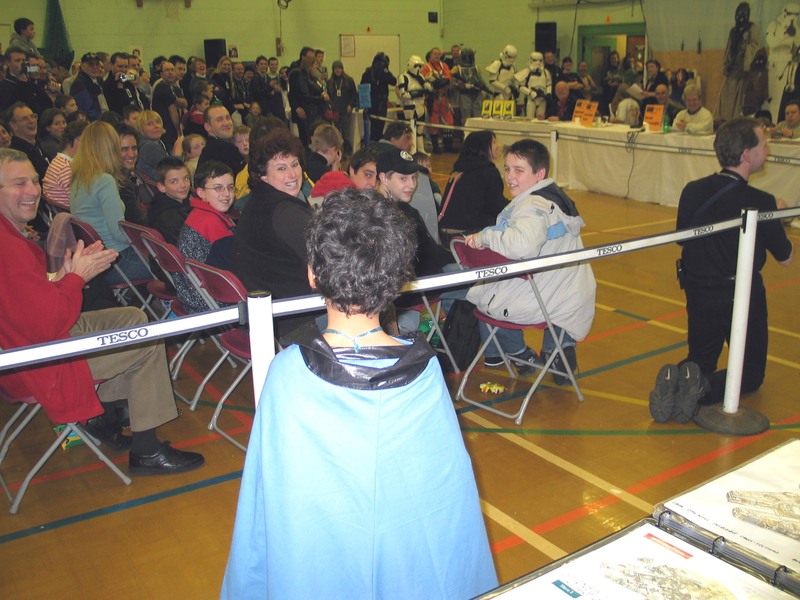 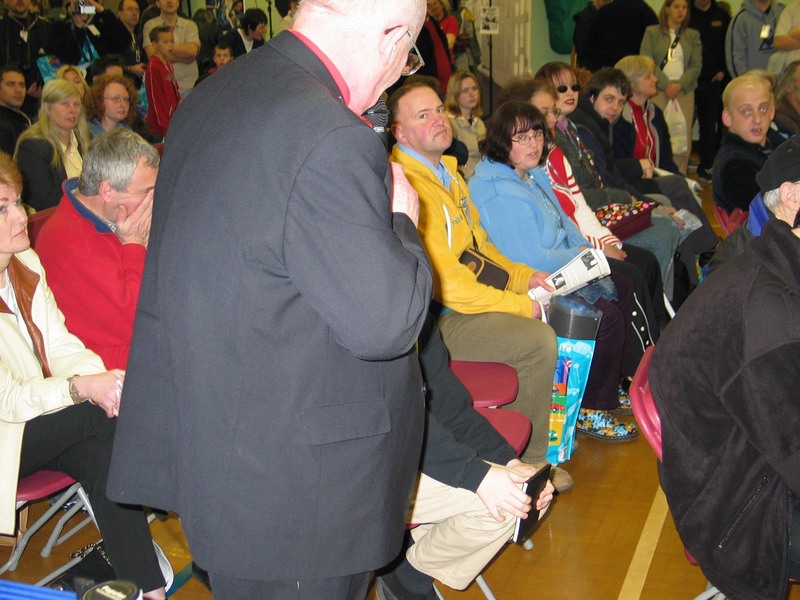 Our MC Michael Sheard was as ever inspirational in his sourcing of questions from the audience – there’s no escaping the eagle eye of Admiral Ozzel! 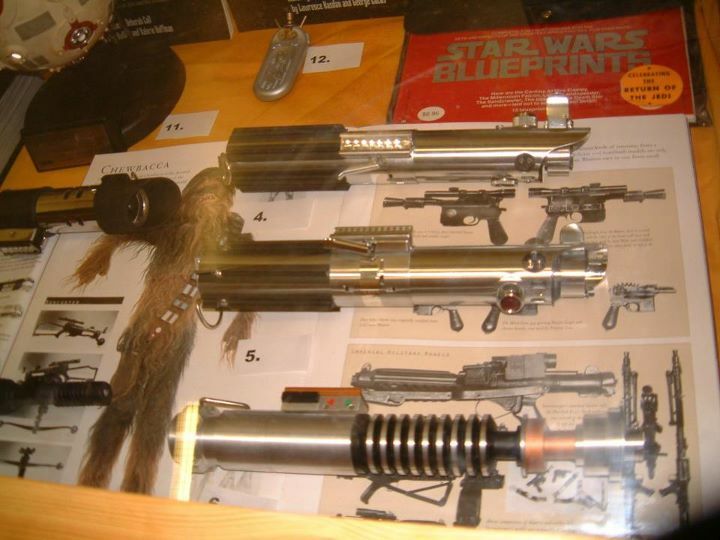 As lunchtime approached there was time to check out the fantastic artwork of Incredible Cross Sections artists Hans Jenssen and Richard Chasemore, represented by Janine Jenssen as they were unfortunately unable to attend in person – they did have a good excuse though, as they were at Skywalker Ranch checking out the top secret designs, artwork and prototypes for Episode 3! 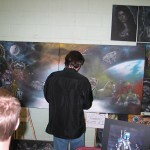 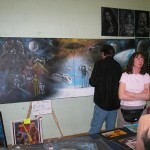 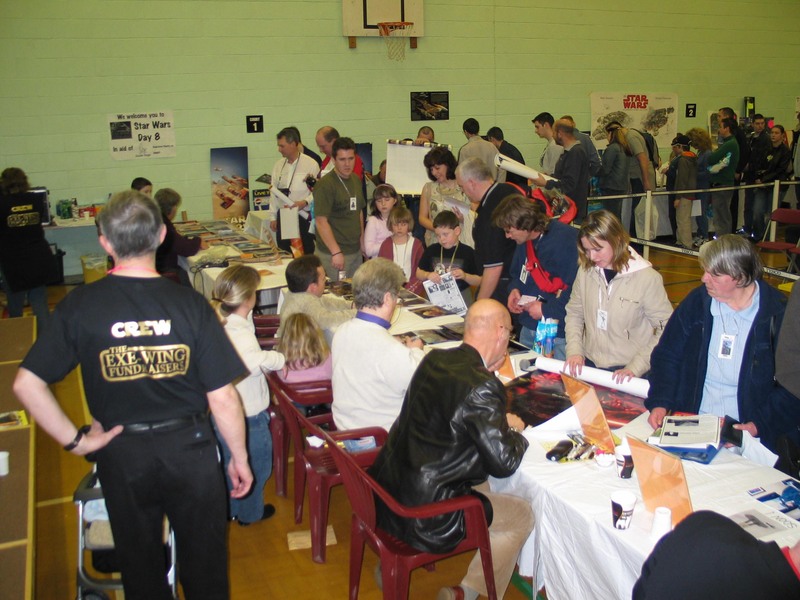 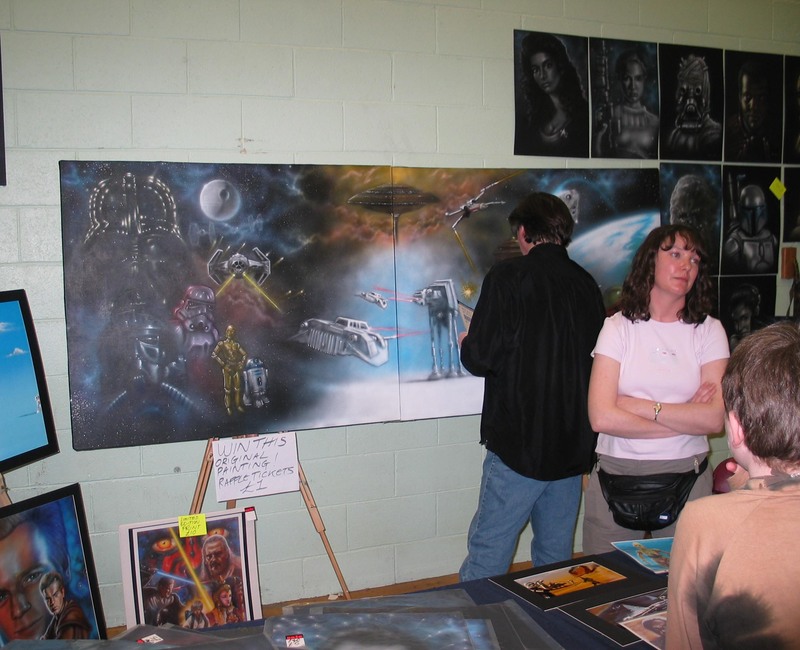 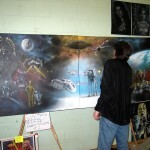 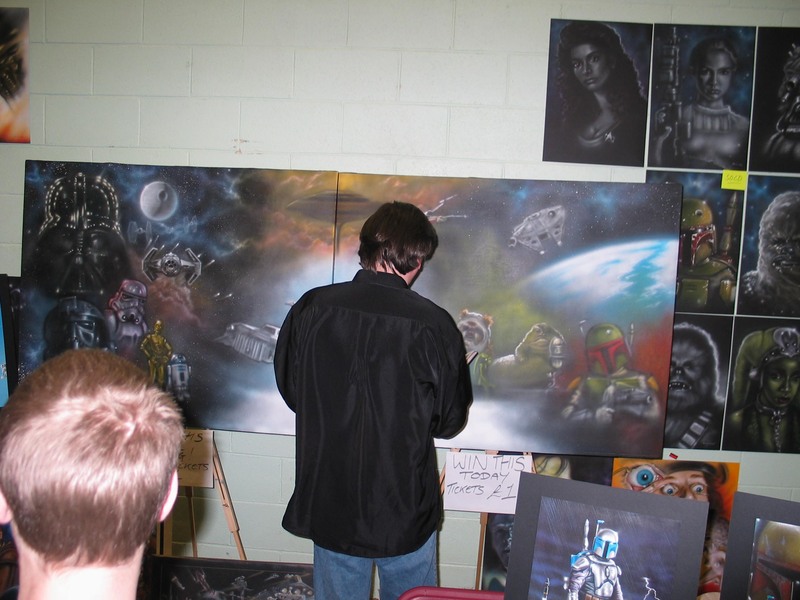 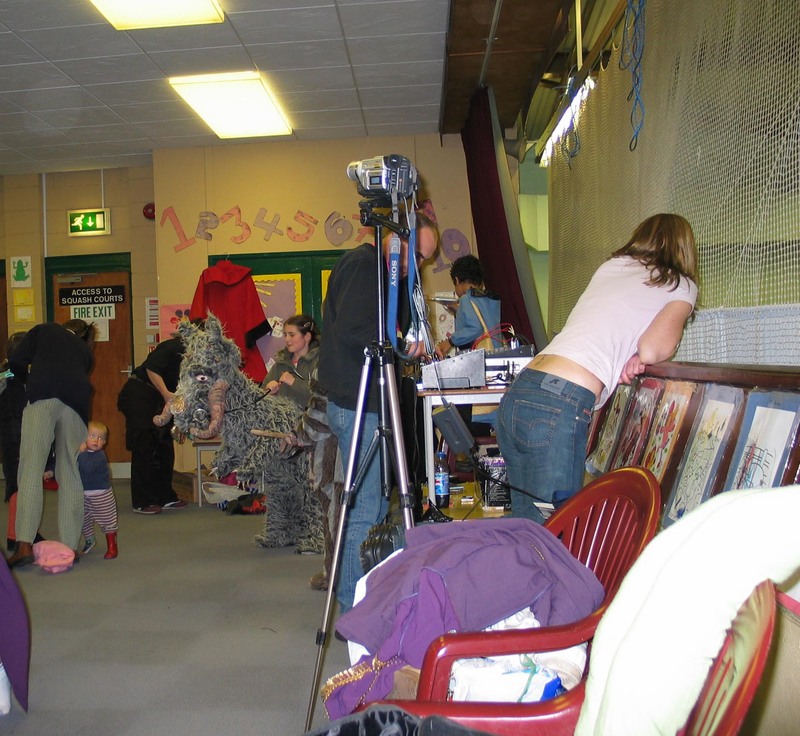 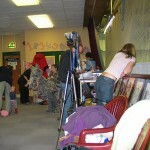 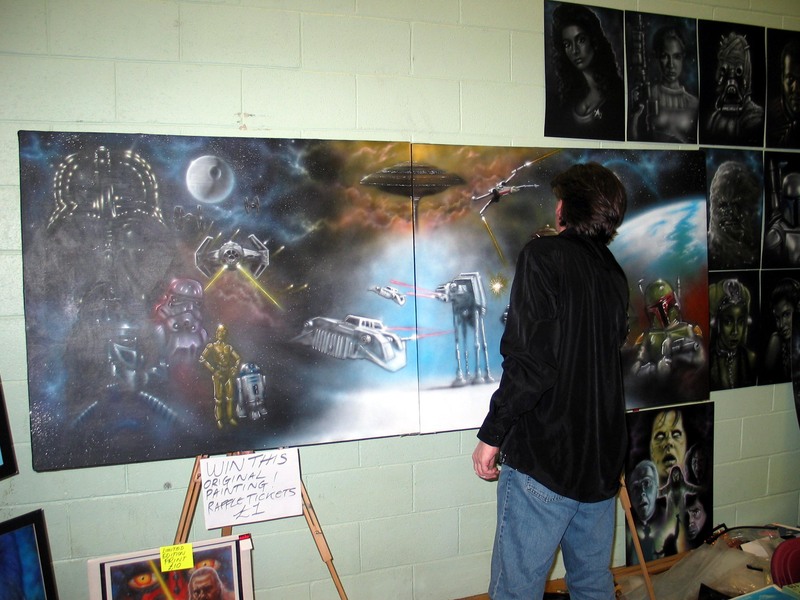 Also attracting considerable attention was the airbrush painting of Airworks Art, as Steve and Jennifer created an enormous wall banner there and then on the day. 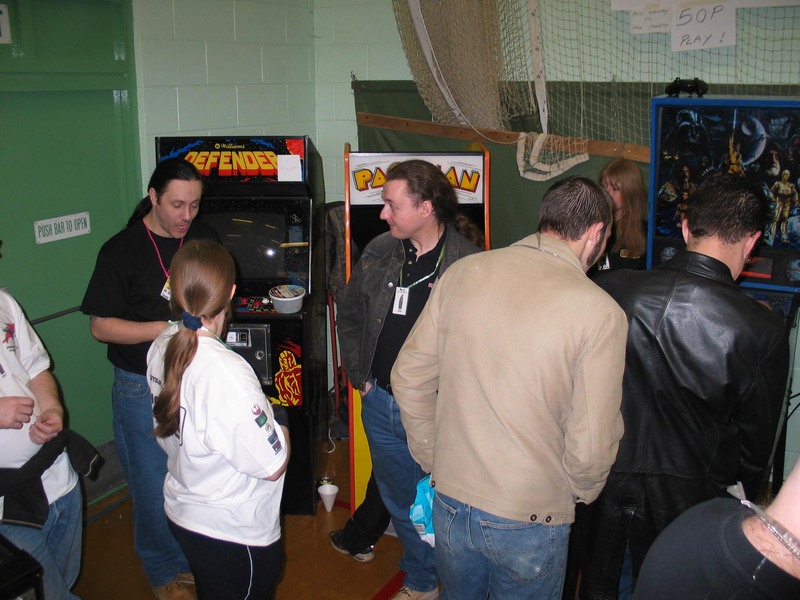 Over lunch, some chose to ponder the questions in the Exe-Wing Quiz, while others searched the halls for the hidden characters in the Scavenger Hunt game. 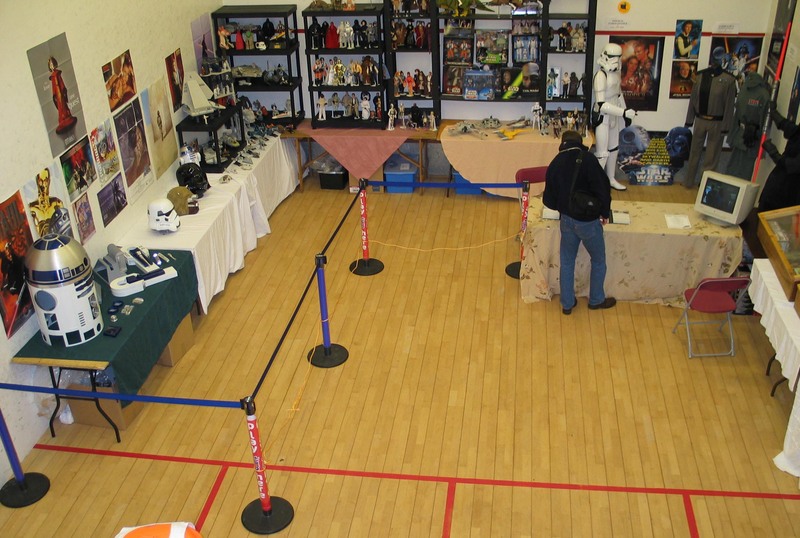 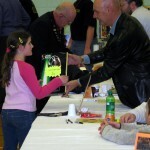 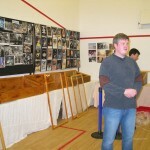 There was also an oppotunity to check out the entries in the Art and Model competitions, with a particularly high standard on display. 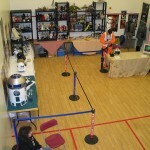 The video room provided a great place to unwind for a while, and watch a selection of hard-to-find Star Wars footage including interviews, behind the scenes documentaries, cartoons, rare footage, and other little snippets. 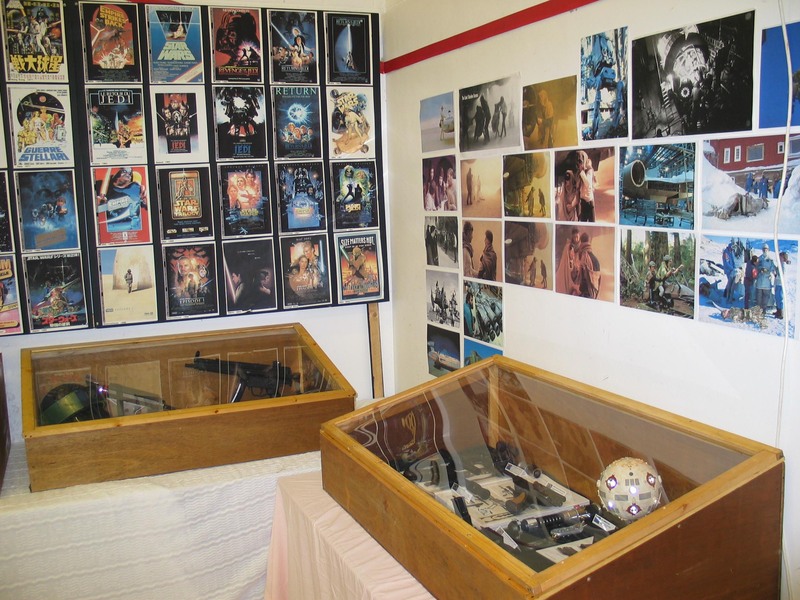 This year, a second video programme was also running in the Display Room, with a further selection of eye candy to enjoy. 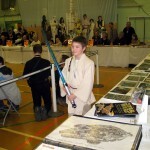 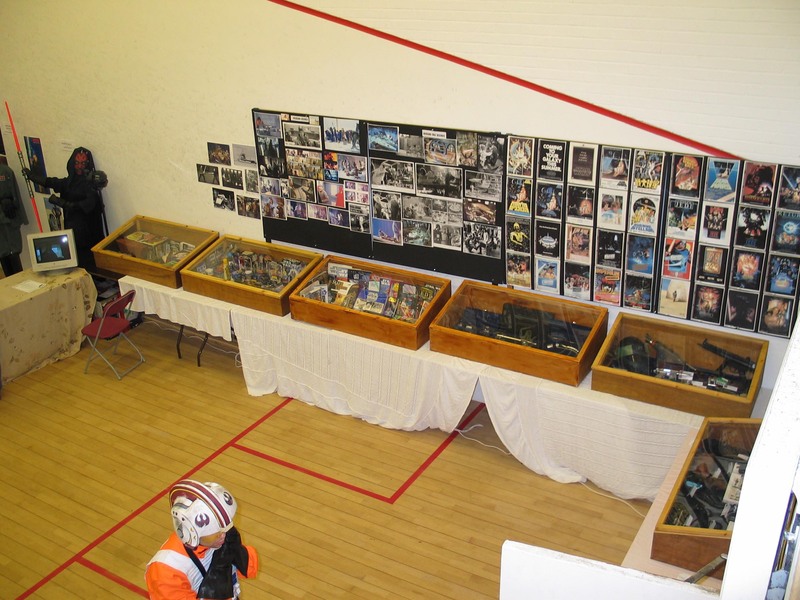 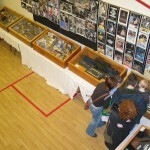 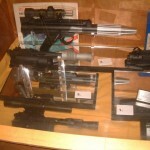 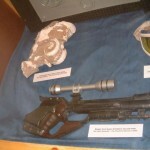 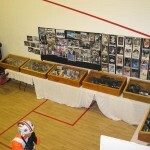 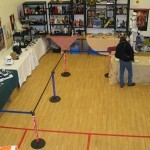 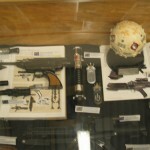 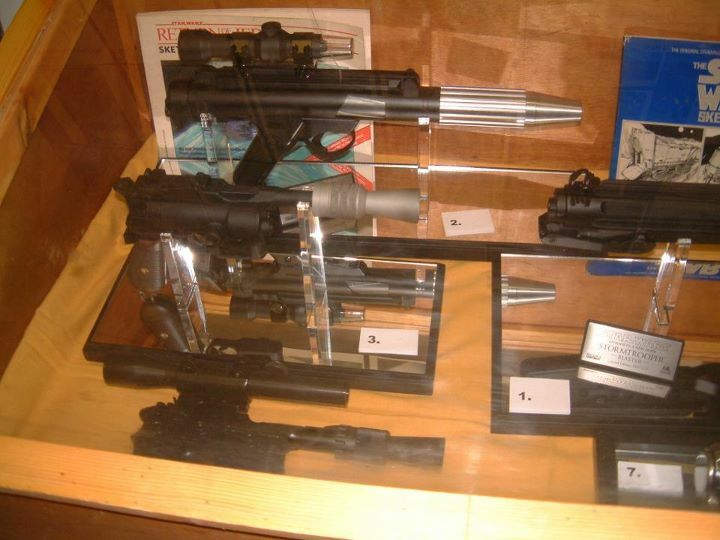 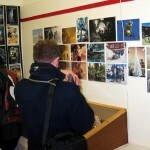 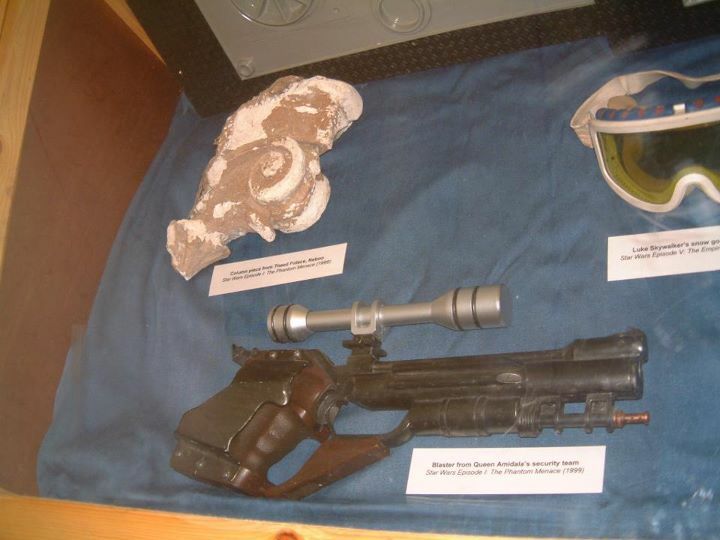 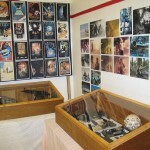 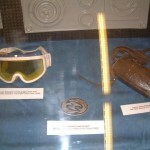 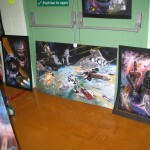 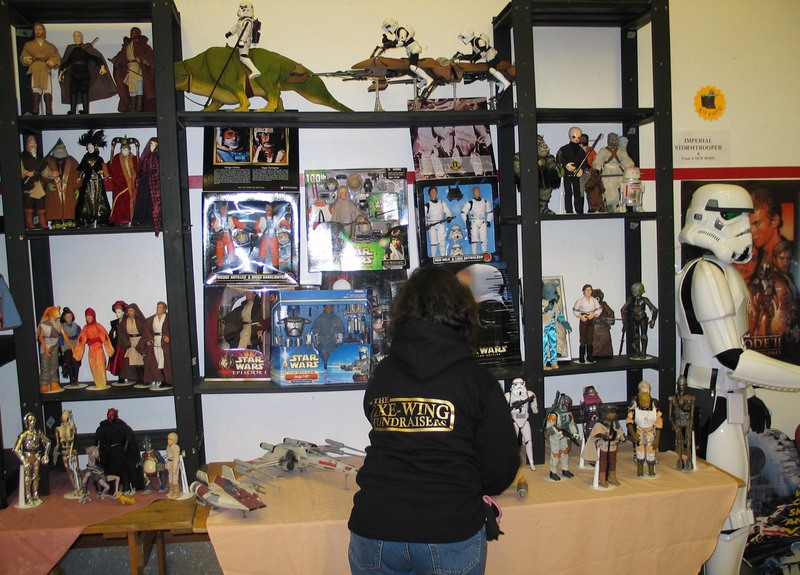 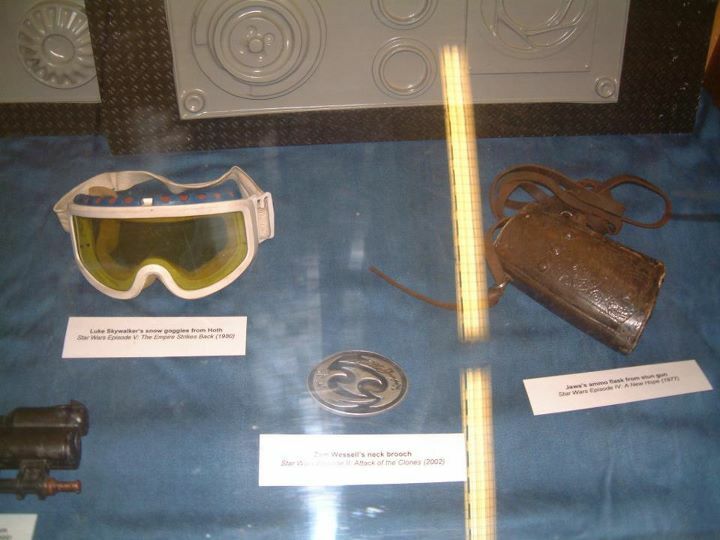 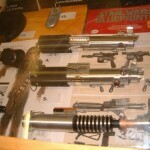 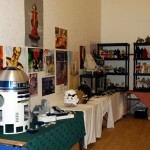 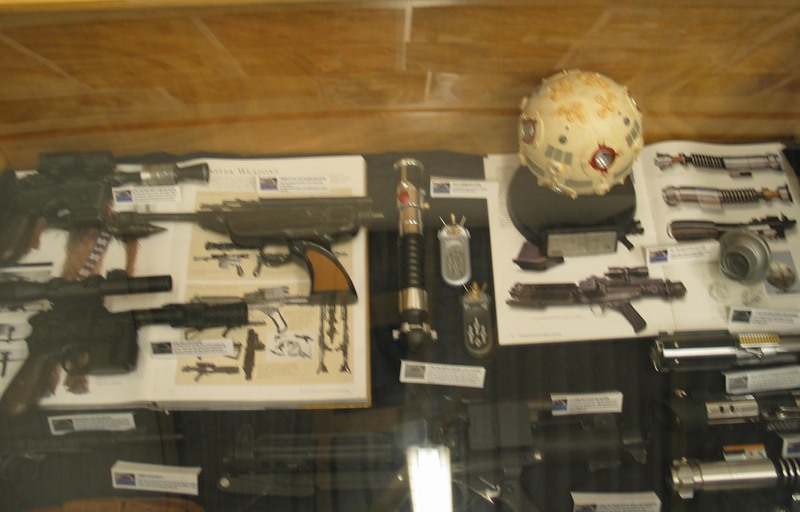 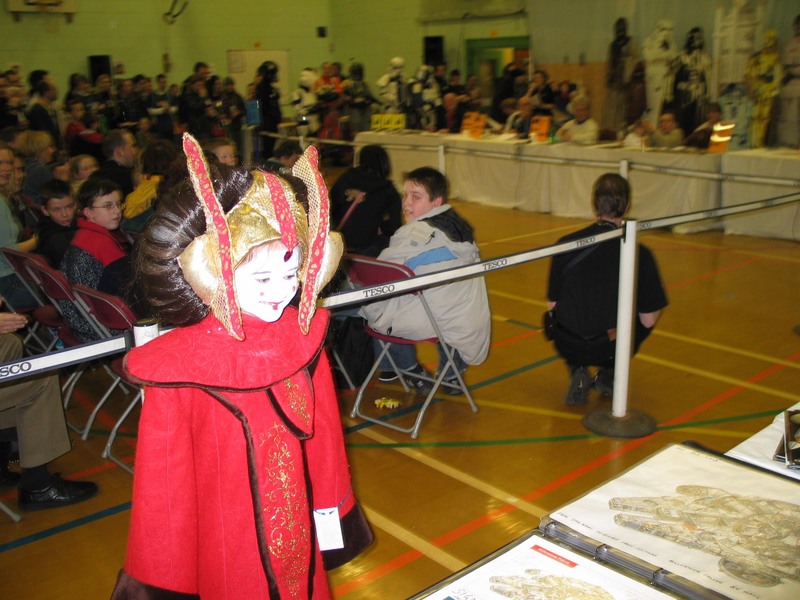 Also in the Display Room were exhibits of all kinds of Star Wars memorabilia including replica props, costumes, toys and collectibles, including a near complete collection of 12” figures. 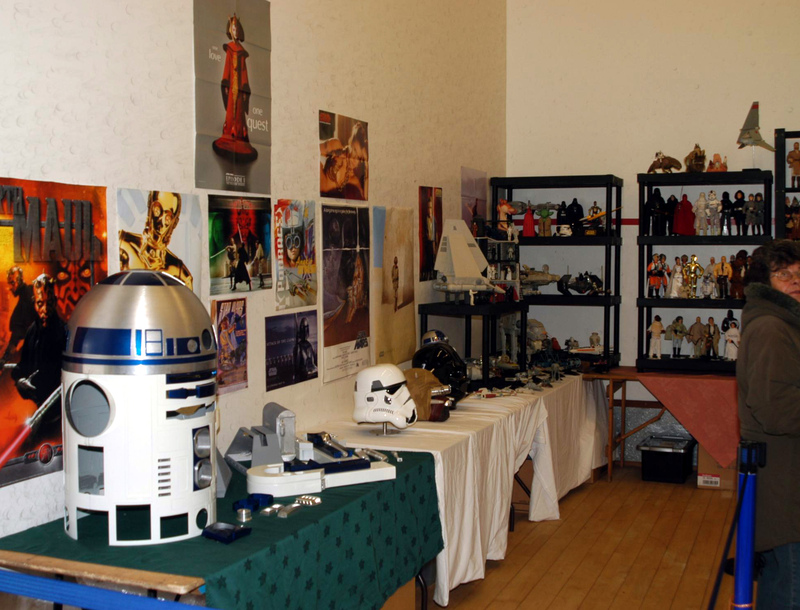 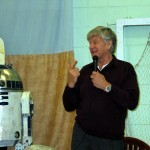 Of special interest were the displays of the deleted scenes from the Star Wars movies, a gallery of Star Wars movie posters, and the Droid Factory – an exhibit of the work in progress in the construction of an authentic replica of R2-D2. 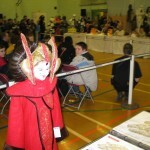 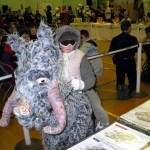 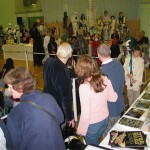 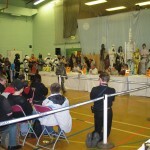 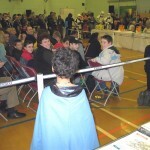 Back in the main hall the fancy dress contest was getting into full swing with a parade of young heroes and villains, humans and aliens, all excellent in quality, and showing a great deal of time and effort in their creation. 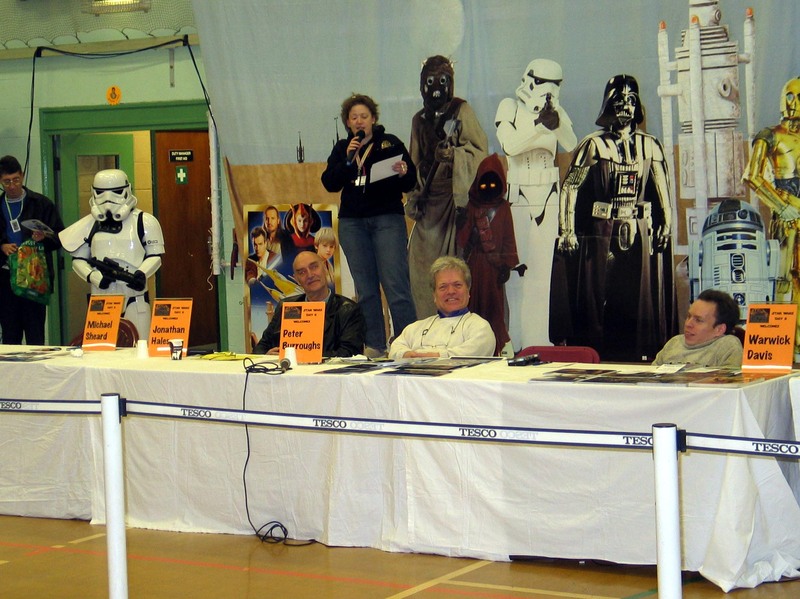 In the adult section the standards were equally good with some very high quality work, and not one but two Slave Leias to raise the temperature in the hall somewhat! 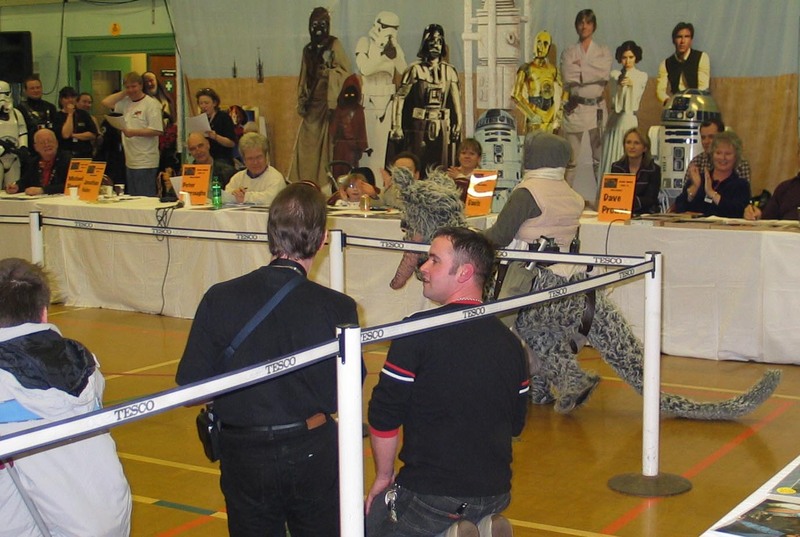 The UK Garrison guys were still going strong entertaining the crowds, and their photograph booth proved exceptionally popular, offering attendees the chance to appear in the Death Star corridors with the Star Wars character of their choice. 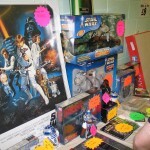 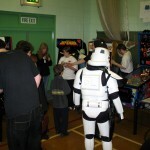 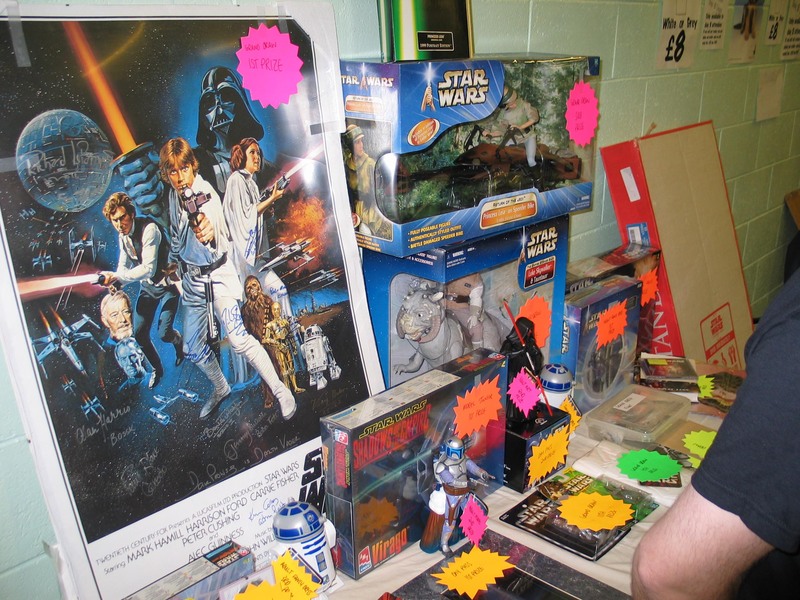 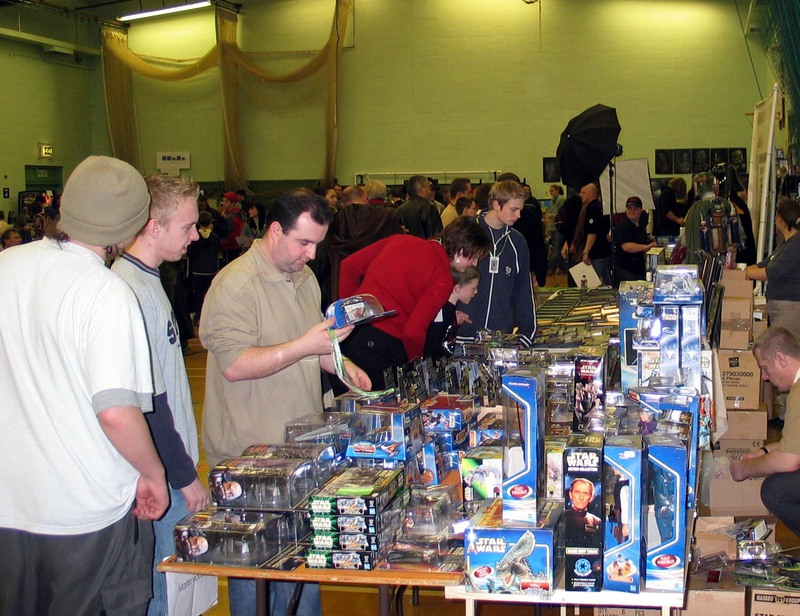 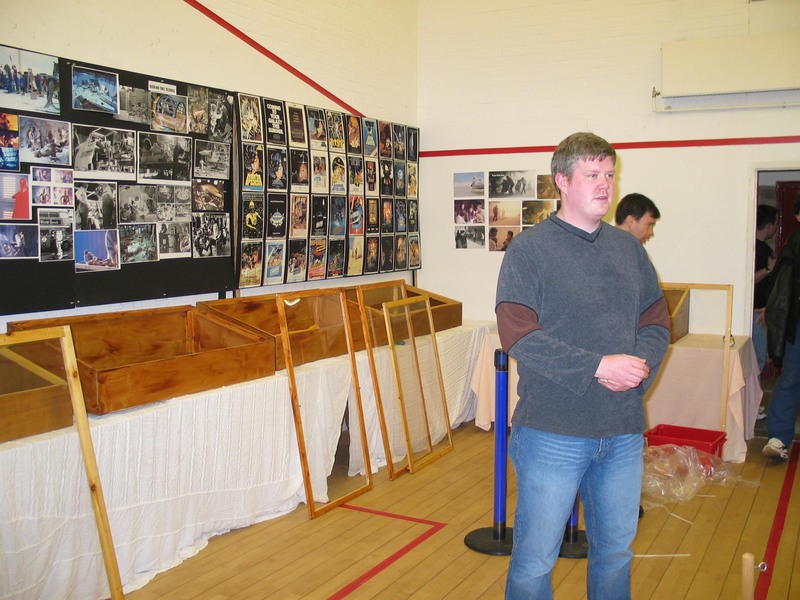 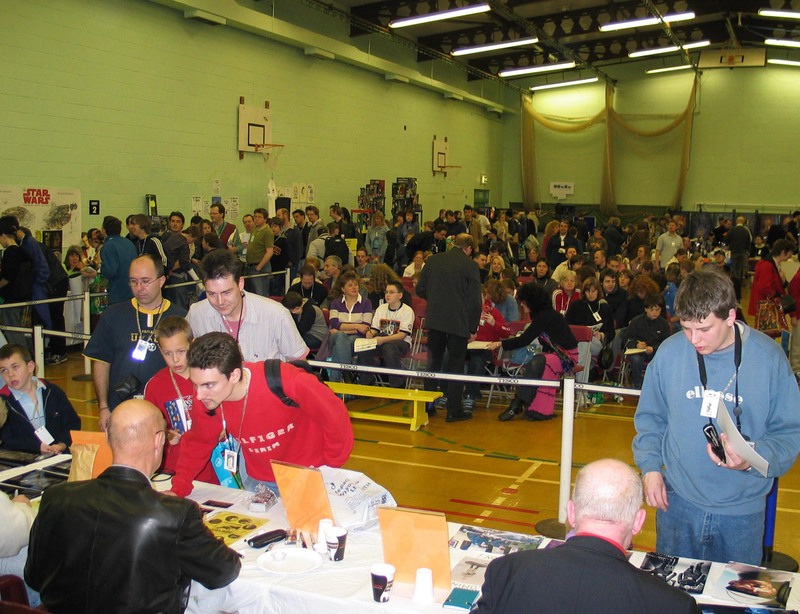 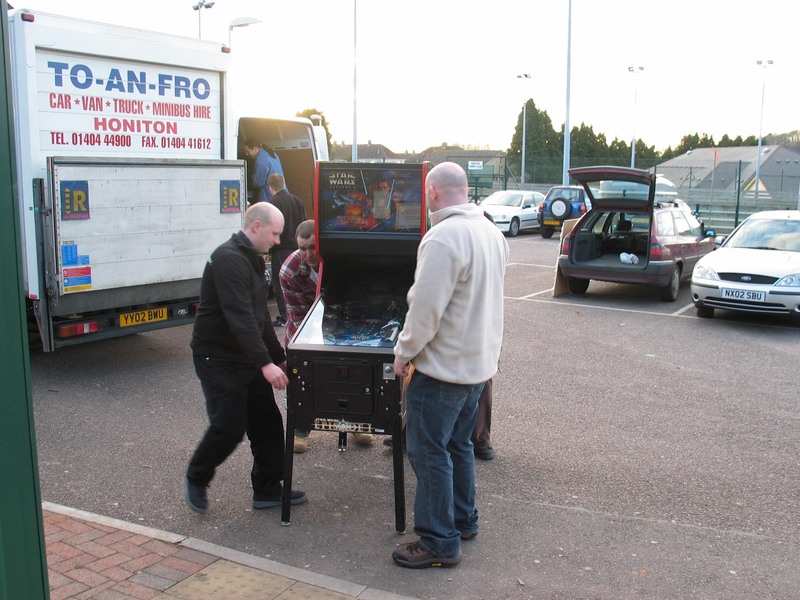 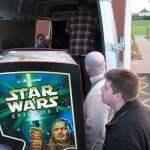 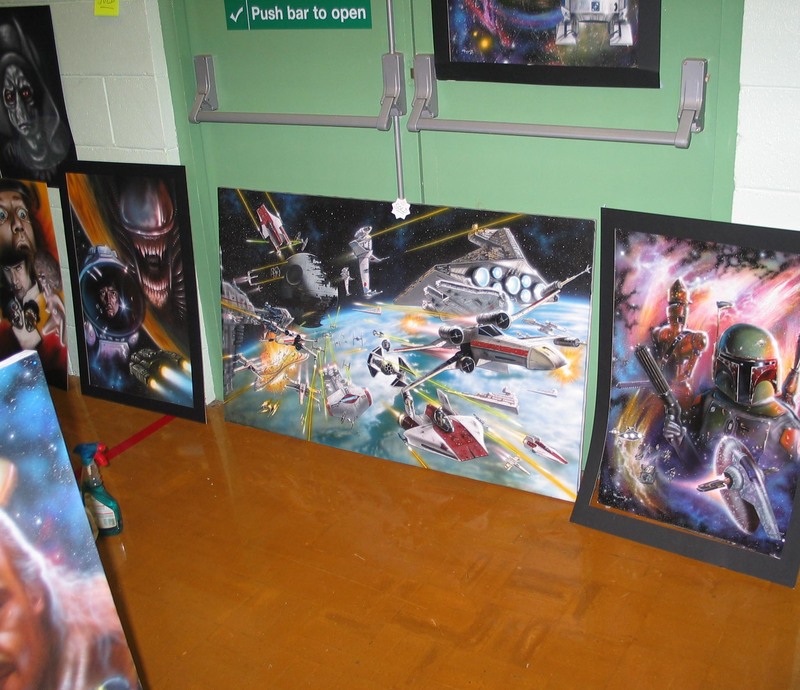 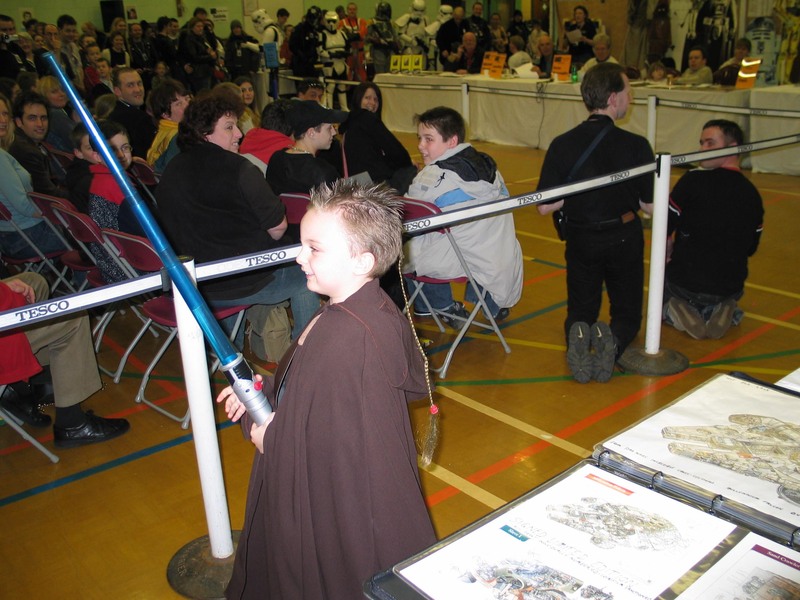 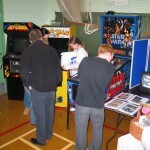 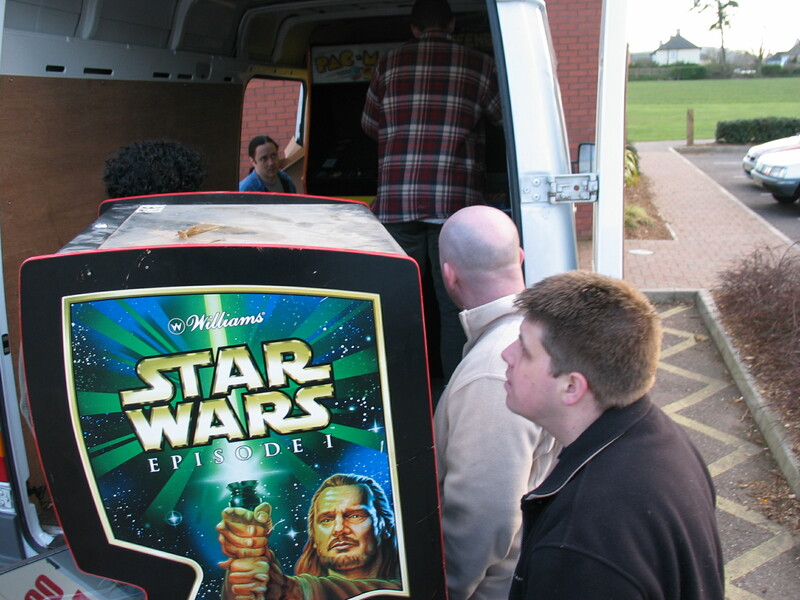 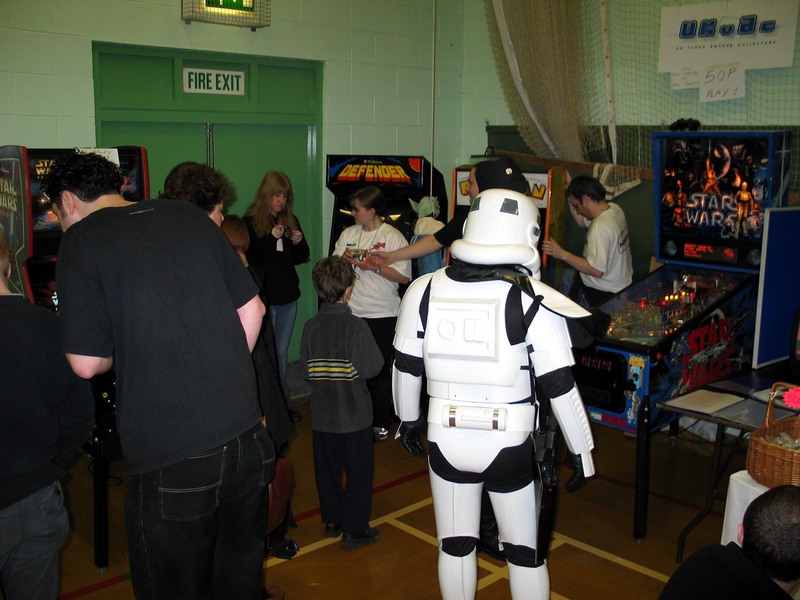 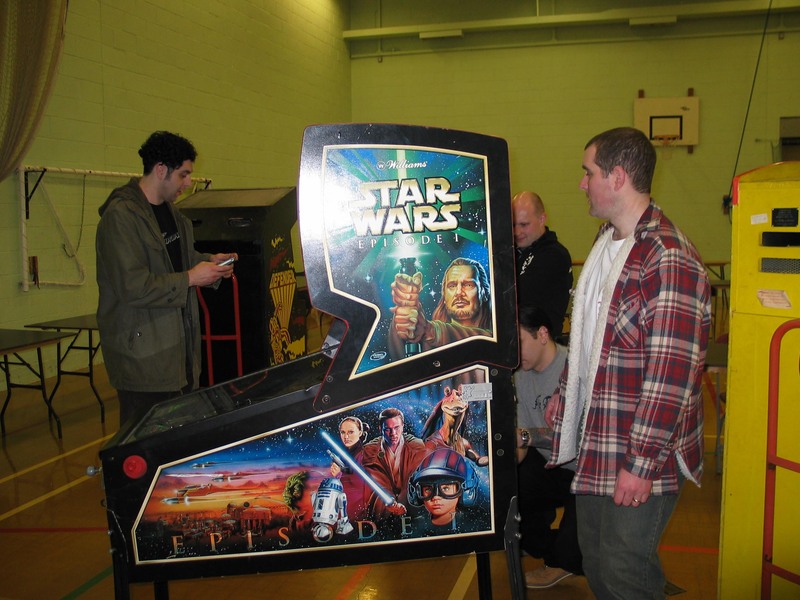 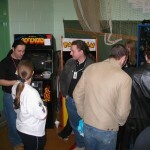 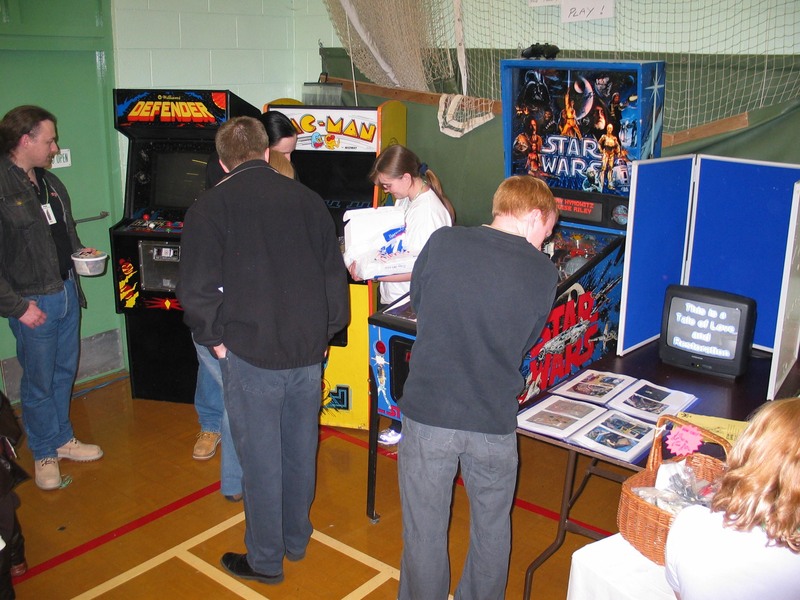 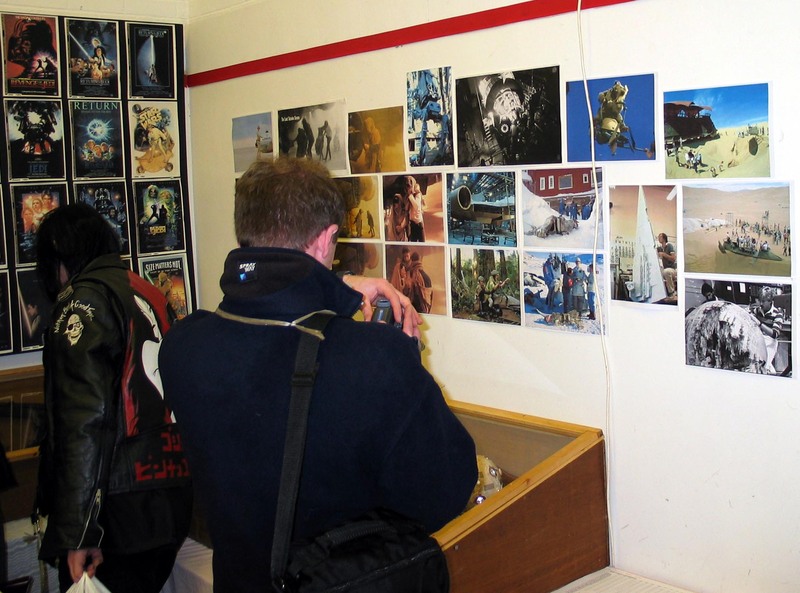 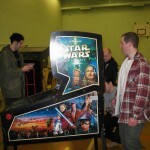 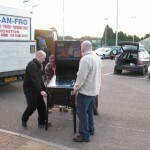 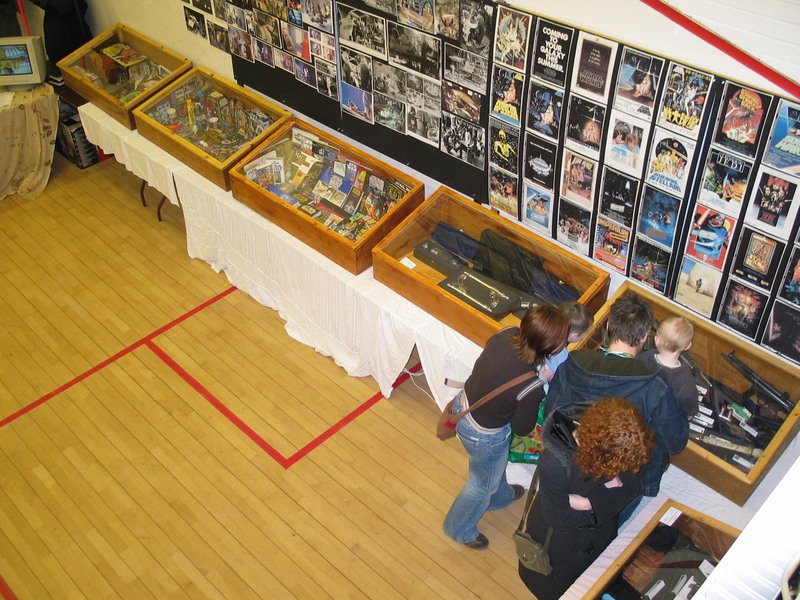 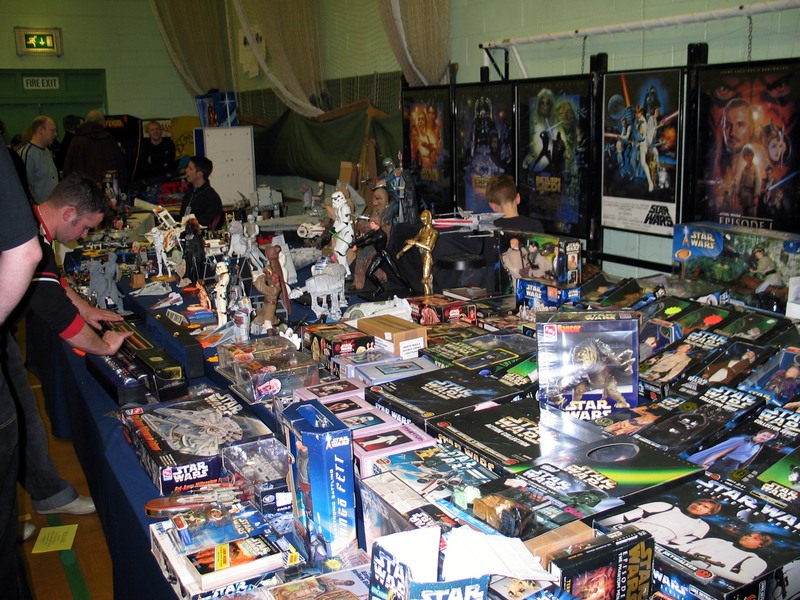 Also attracting attention were the arcade machines supplied by the UK Vintage Arcade Collectors, offering a rare chance to play on some fine restored machines, including the excellent Star Wars pinball table. 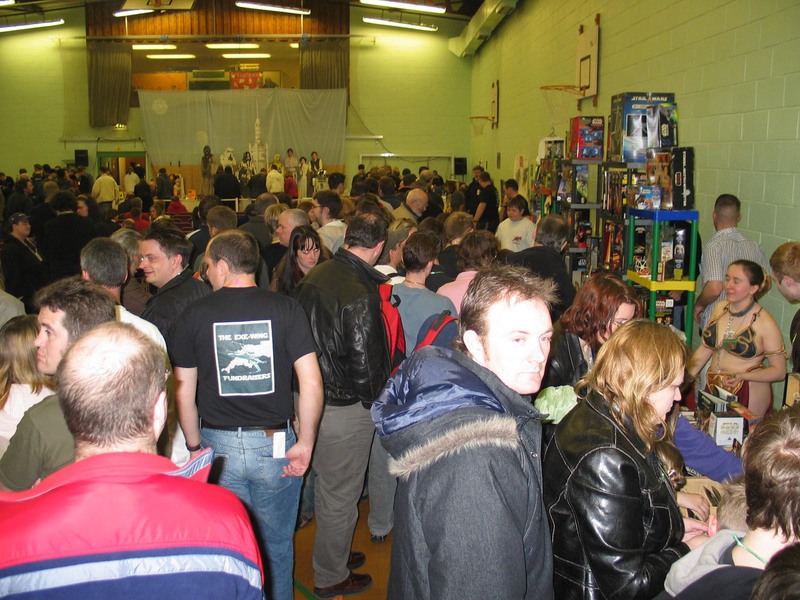 As the day wound down the Exe-Wingers and friends were able to look back on another highly successful day, and the positive feedback from the guests, the dealers, the exhibitors and the attendees was great to hear. 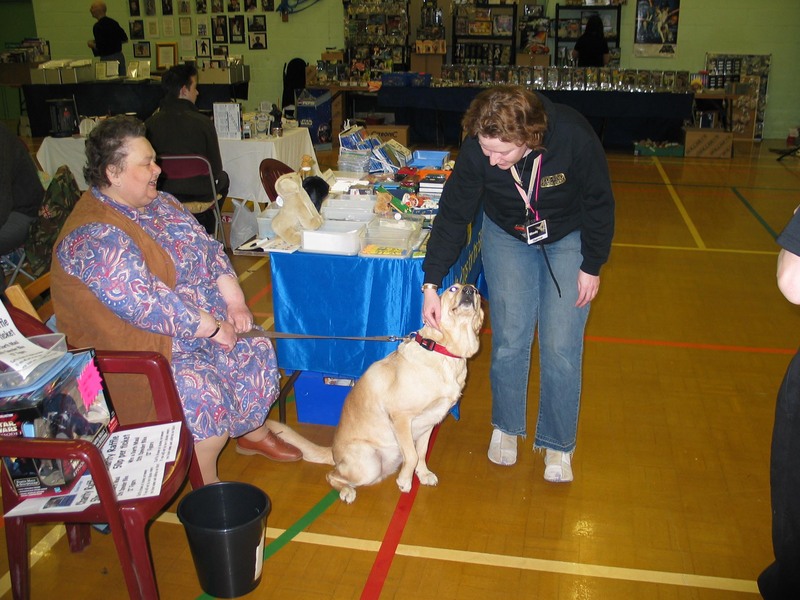 When the final totals were counted, we were delighted to be able to donate a cheque for £5,000 on to the Guide Dogs, gratefully accepted by guide dog Dolby and her owner Tilly. 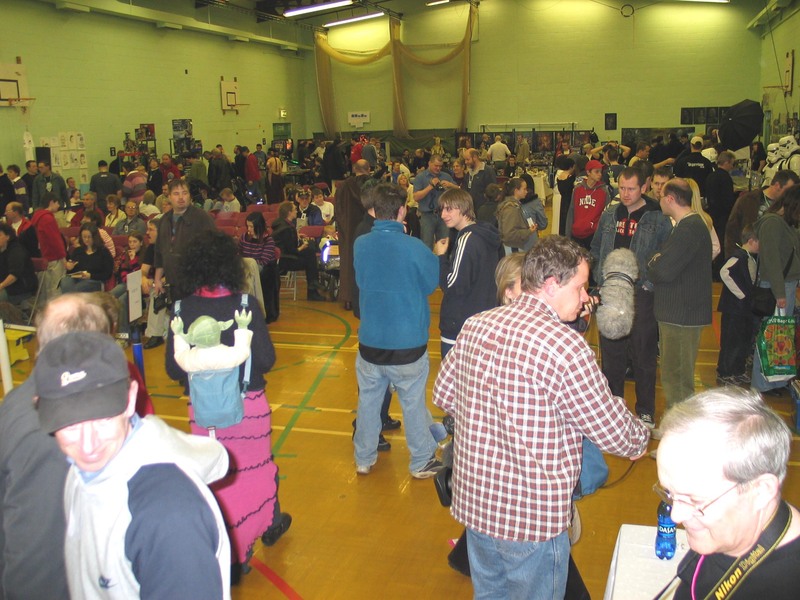 This has been the Exe Wing Fundraisers most successful year ever, both in the scale and scope of the Day, and the amount raised for our chosen charity. 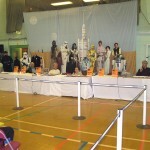 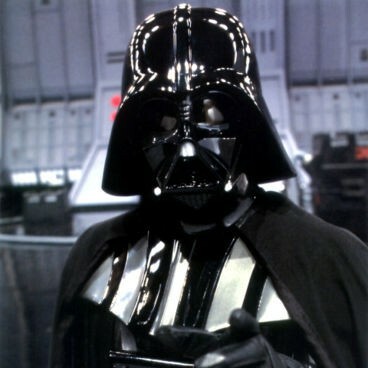 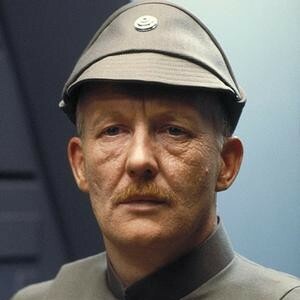 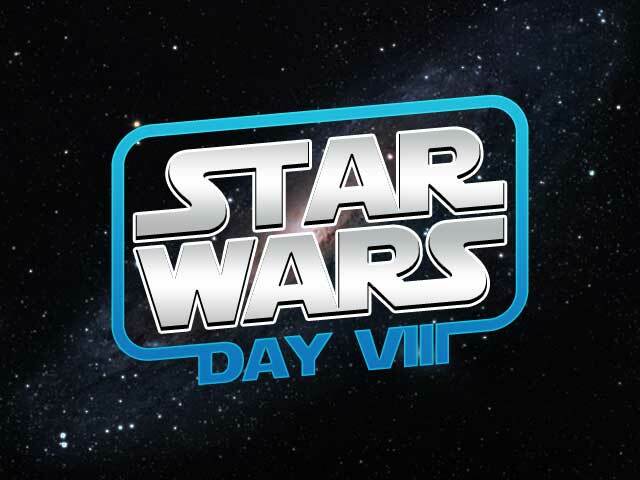 Well done all round – and here’s to Star Wars Day 9!